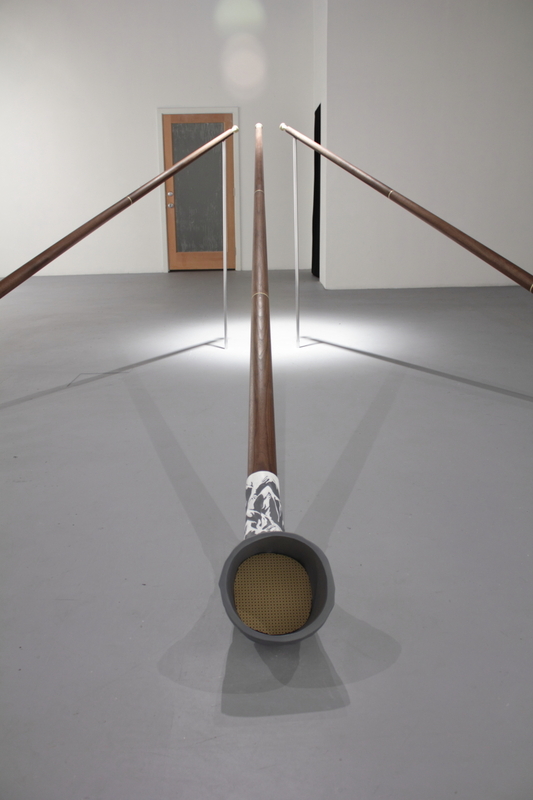 For Las Cienegas Projects’ final month of exhibitions, we are very pleased to announce Sculpture Garden, a collaborative installation conceived of by Steven Hull and including work by Steven Hull, Amy Thoner, Dewey Ambrosino, Tami Demaree, April Totten, and Donnie Stroud. 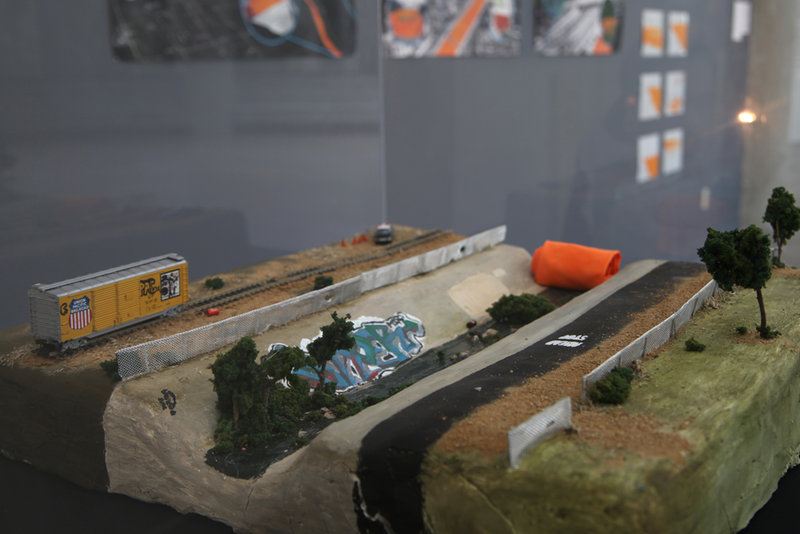 The installation will turn the main gallery into a fictional landscape that will include a moving passenger train for 2, photographic “billboards”, topographical hillscapes, sculptural works, and other elements found in gardens, outdoor leisure spaces, and trainscapes. 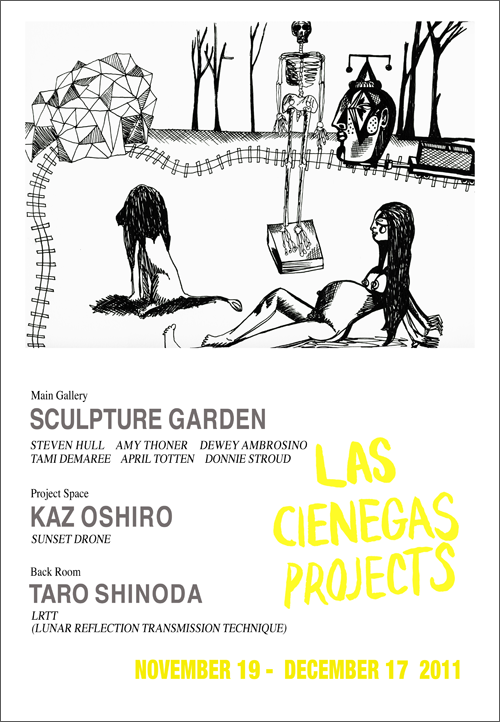 Las Cienegas Projects is pleased to present Sunset Drone, a solo exhibition by Kaz Oshiro. 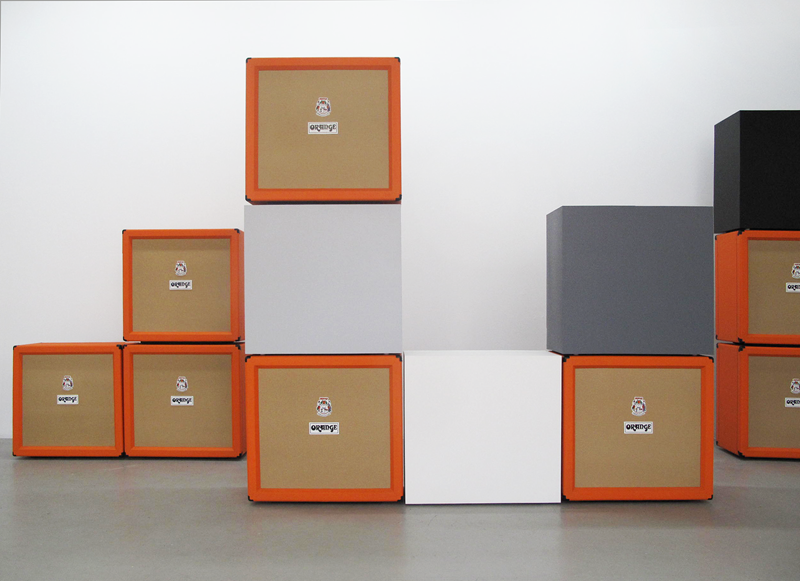 The exhibition includes Orange Speaker Cabinets and Gray Scale Boxes (18 parts), an installation comprised of twelve “Orange brand speaker cabinets” and six gray scale boxes, all made out of stretched canvas, acrylic paint and Bondo. 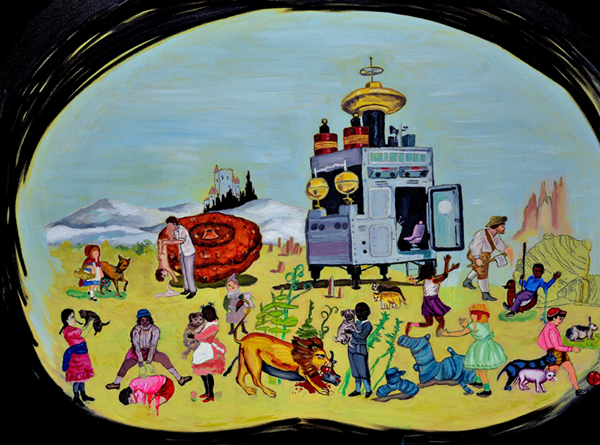 Kaz Oshiro’s trompe l’oeil style works 3-dimensionally depict American subcultural artifacts and familiar objects such as brightly colored Marshall amps, sticker-laden pickup truck tailgates, public garbage containers, and kitchen appliances. 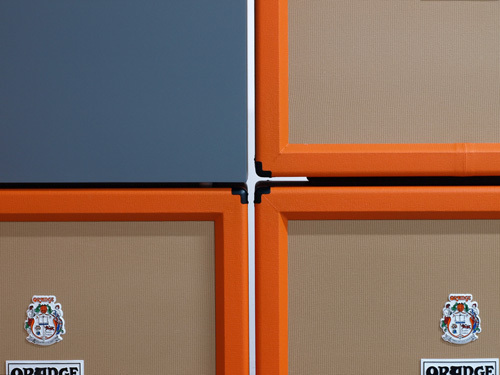 Done on box-shaped stretched canvases, the works often deal with the abstract qualities of surface and other issues of painting: scuff marks, scratches, dust, finger prints and gooey marks on specific surface finishes. 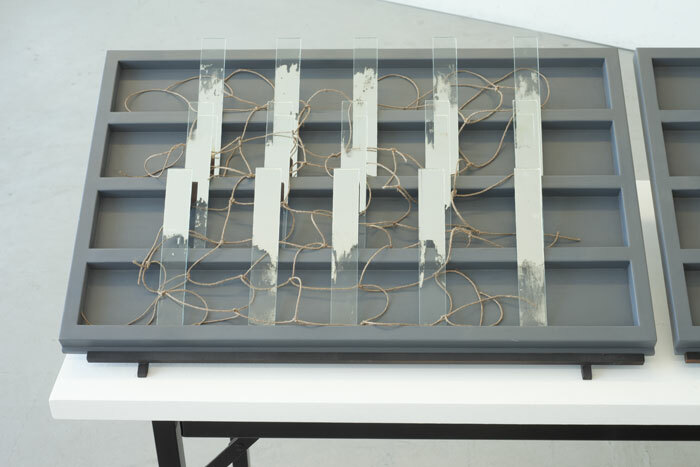 Yet while Oshiro insists on the primary importance of painting in his practice, there is a simultaneity with sculpture that his works fully engage, along with a conscious interplay between realism and abstraction, pop and minimalism, content and façade. Kaz Oshiro (b.1967) has lived and worked in Los Angeles since 1986. 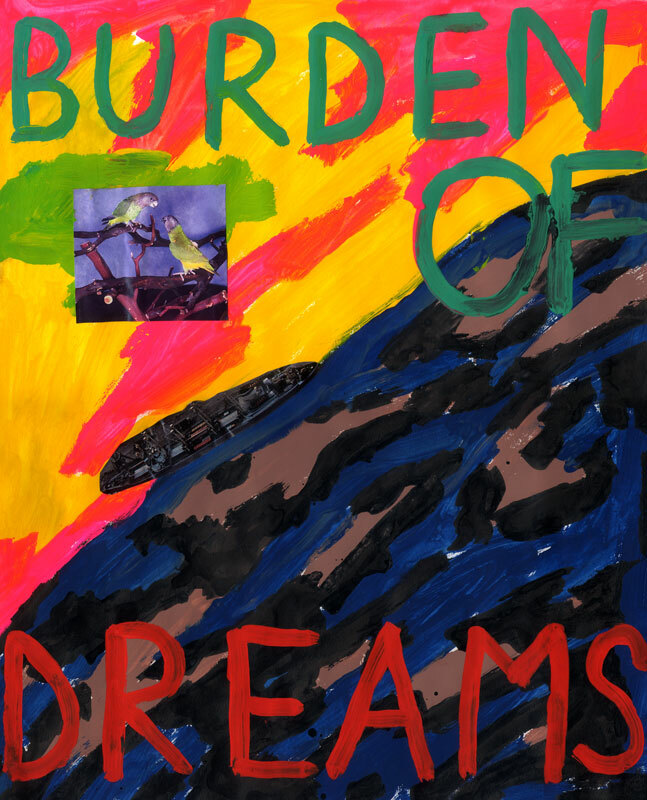 He has held solo exhibitions at Galerie Frank Elbaz, Paris; Galerie Emannuel Perrotin, Miami; Yvon Lambert, New York; and Rosamund Felsen Gallery, Santa Monica. His work has also been exhibited at the Villa du Parc, Annemasse, France; the McNay Art Museum, San Antonio, Texas; the Asia Society and Museum, New York; the Orange County Museum, Newport Beach; Hammer Museum, Los Angeles; the Japanese American National Museum, Los Angeles; and the Museum of Contemporary Art, Los Angeles. He holds a BA and MFA from California State University, Los Angeles. 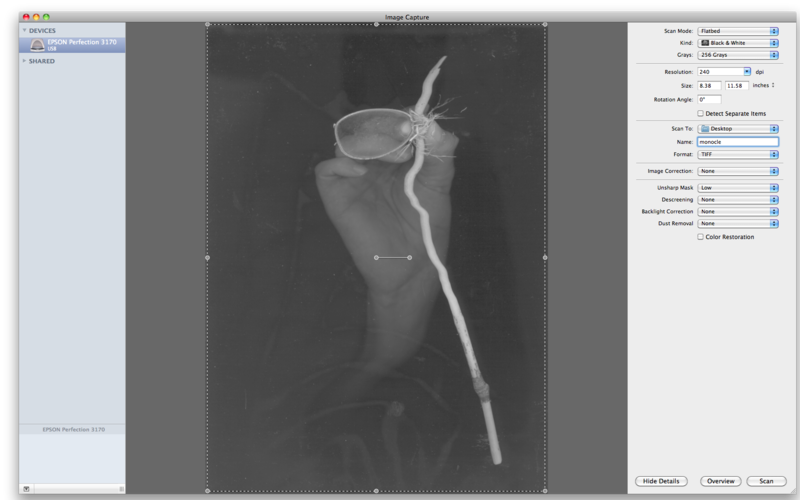 left- Taro Shinoda’s telescopic video camera. Photo: Gulay Yigitcan; right- Taro Shinoda: Lunar Reflections (installation view, Isabella Stewart Gardener Museum), Taro Shinoda, 2009. Photo: Clements/Howcroft Photography. 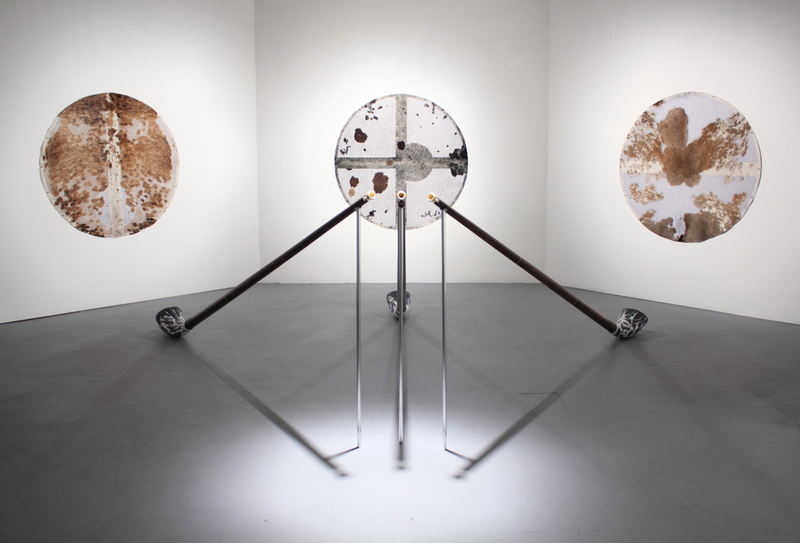 Las Cienegas Projects is pleased to present Taro Shinoda’s LRTT (Lunar Reflection Transmission Technique). 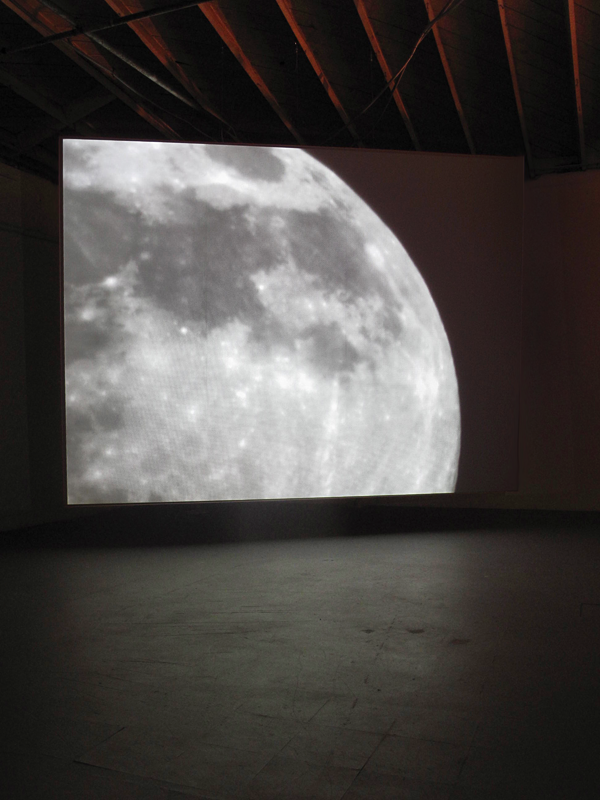 LRTT is a continually developing, 90-minute telescopic video installation. Motivated by the desire to view and experience the moon as a mutually shared phenomenon, Shinoda crafted a rudimentary astronomical telescope out of scrap corrugated cardboard and connected it to a video camera, setting out from different parts of the world to videotape the moon’s passage across the telescope’s field of view, as well as images of each city he visited (including Tokyo, Istanbul, Limerick, and Boston). For the exhibition at Las Cienegas Projects, Shinoda will include cityscape and lunar footage shot in and from Los Angeles. The project began during the artist’s month-long stay at Boston’s Isabella Stewart Gardner Museum in the spring of 2007, when Shinoda was inspired by the moonlight and the sense of calm found late at night in the museum courtyard. Yet its roots lie in his early childhood memories of trying to communicate with his mother over great distances, entrusting messages to the moon, which he hoped his mother would receive on the other side of the planet when the moon rose for her. The art of Taro Shinoda engages themes of science, philosophy, and desire, and investigates both our place in the universe and within contemporary society. Shinoda was born in 1964 in Tokyo, Japan, where he continues to live and work. He has held solo exhibitions at the Isabella Stewart Gardner Museum, Boston; REDCAT, Los Angeles; GALLERY SIDE 2, Tokyo; and Hiroshima City Museum of Contemporary Art, Hiroshima, among others, and has participated widely in group exhibitions including the 2011 Asian Art Biennale, Taichung; Transparency: Art for Energy, MACRO, Rome; He’e ualu, Galerie Frank Elbaz, Paris; Sensing Nature, Mori Art Museum, Tokyo; the 10th International Istanbul Biennial, Istanbul; and Time After Time: Asia and our moment, Yerba Buena Center for the Arts, San Francisco. Las Cienegas Projects is pleased to present Double Location (The Ambassador Hotel), a sculptural, three-channel video installation by Berlin-based Austrian artist Karina Nimmerfall. The starting point of the project is the legendary Ambassador Hotel in Los Angeles, built in 1921 and pulled down in 2006. The hotel is not only linked to the history of Hollywood – where in the Roaring Twenties the bold and beautiful were bustling about and which during the 1930s hosted the Oscar Nights six times – but also received negative fame, as Robert Kennedy was assassinated in its kitchen 1968. After the hotel was shut down in 1989, it was exclusively used as a movie set for film & television productions and ranged among the most widely used sets in Los Angeles. 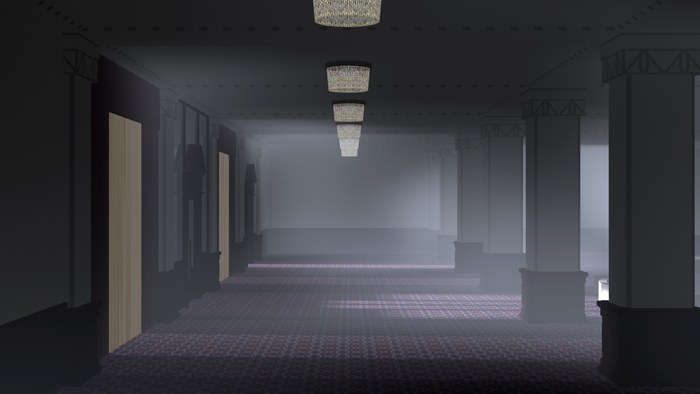 Double Location (The Ambassador Hotel) uses this history in order to reconstruct the famous hotel lobby; the reconstruction is not, however, an objective architectural model based on documentary material, but instead a virtual space grounded in collective memories and medially transported descriptions of space. Generated from a variety of layers of media information and designed as an active physical and sculptural space, the installation evaluates one’s relation to mediated images and conventions. Playing with the phenomenon of a multiple film set and suggesting that “being on-site” implies moving through a series of image spaces, this three-dimensional enactment reacts upon the perception of the “real space” of the hotel, and thus on our own perceptions of reality. Karina Nimmerfall is a visual artist based in Berlin, Germany. She studied Visual Arts at the Hochschule für bildende Künste in Hamburg, Germany and Art History at the University of Vienna, Austria. 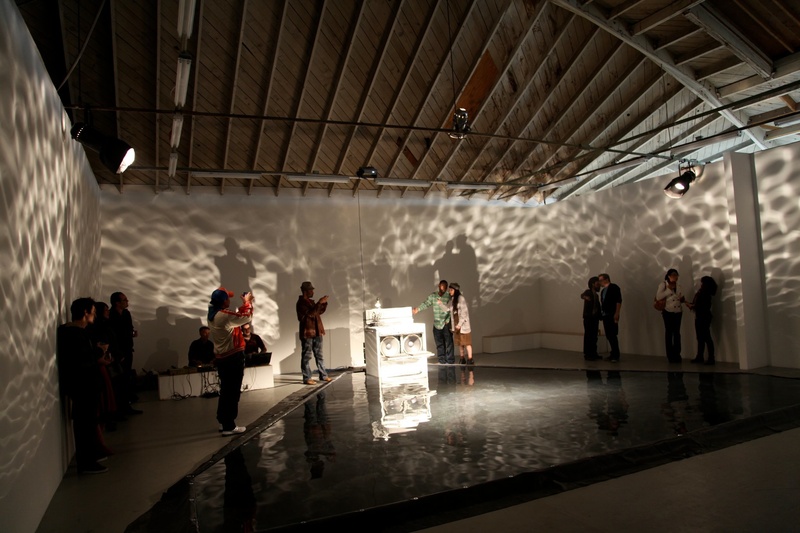 Nimmerfall was Visiting Artist-in-Residence in the Graduate Studies Program at Art Center College of Design in Pasadena (2010-2011). She was also awarded a fellowship at the Cité Internationale des Arts in Paris (2007) and the MAK Center for Art and Architecture in Los Angeles (2002), amongst others. 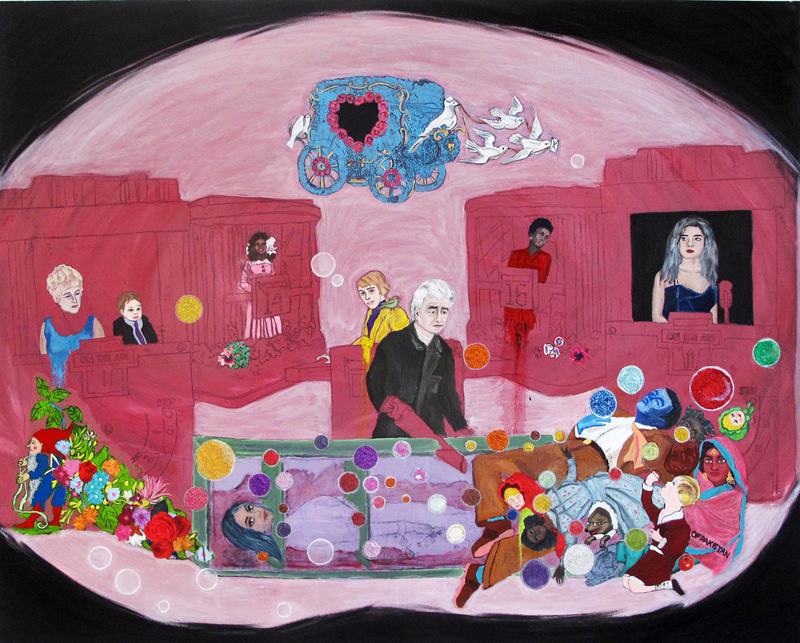 Recent exhibitions include Kunstpalais Erlangen, Germany (2010); BAWAG Contemporary, Vienna, Austria; Kasseler Kunstverein, Germany (2009); Göteborgs Konsthall, Sweden; Bildmuseet, Umea, Sweden; Slought Foundation, Philadelphia; AR/GE Kunst Galleria Museo, Bolzano, Italy; Medienturm Graz, Austria (2008); Landesgalerie Linz, Austria and Camera Austria, Kunsthaus Graz (2007). 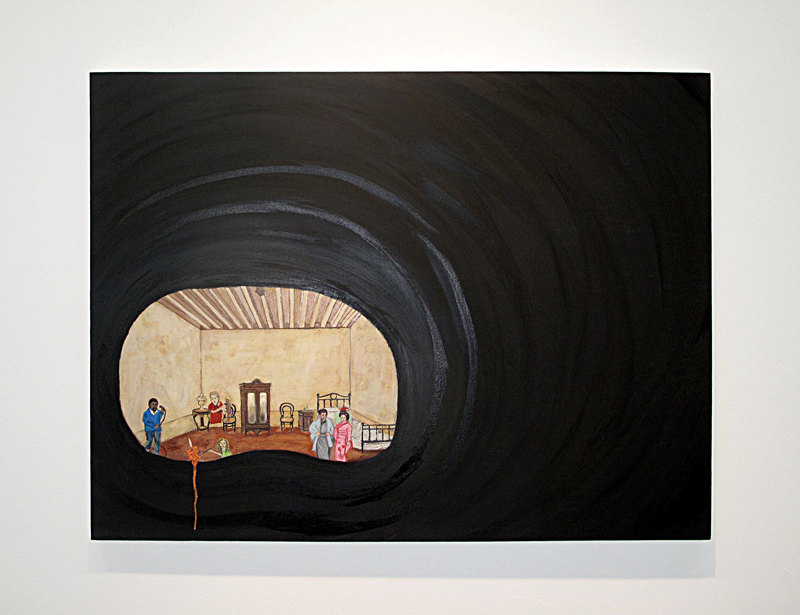 Her work was also included in the Bucharest Biennale 3 in 2008 and the 8th Havana Bienale in 2003. Upcoming presentations include a solo exhibition this fall at Galerie Grita Insam, Vienna, as well as a group exhibition at the Kunsthalle Mainz, Germany. 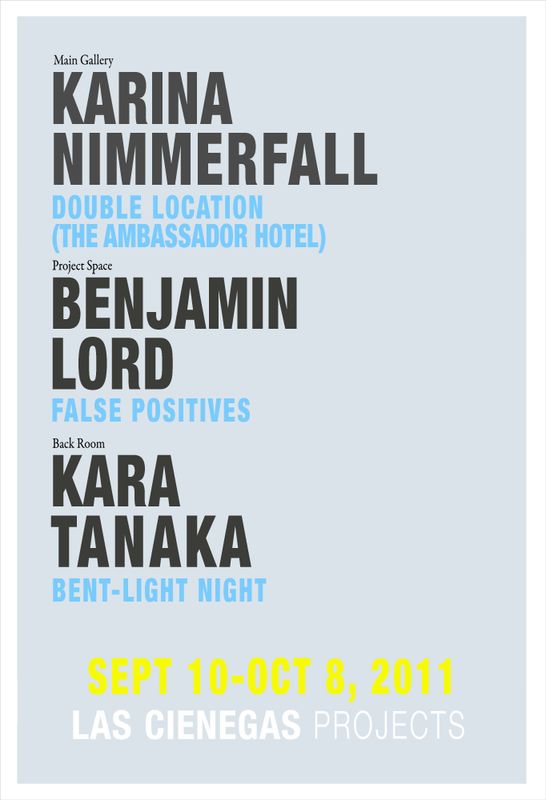 Las Cienegas Projects is pleased to present False Positives, a solo exhibition by Benjamin Lord. The exhibition consists of three interrelated groups of works that together explore the poetics of time, material, presence and perception. 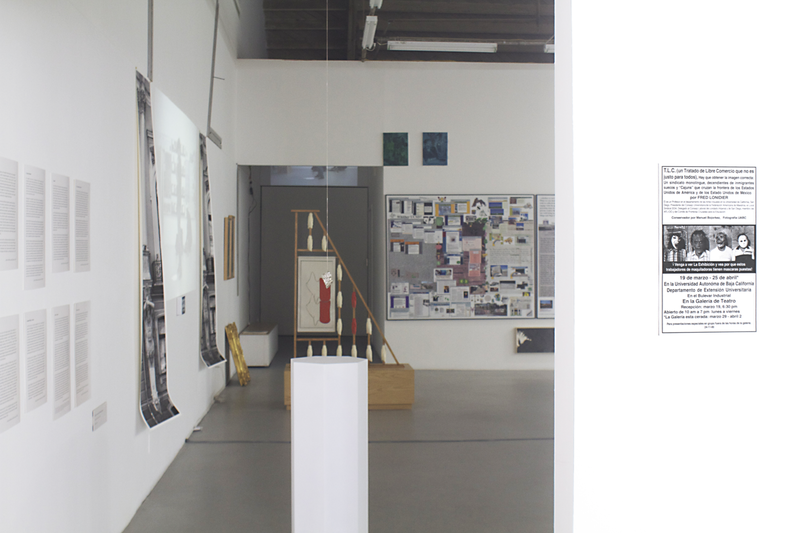 Within the gallery, three distinct but overlapping zones are defined. In the first zone, large color prints depict phosphenes, appearances of light caused by something other than light, a phenomenon well known since antiquity. These images build on a formal vocabulary initiated by Eaton Canyon Phosphenalia, a portfolio of color prints Lord created in 2006. 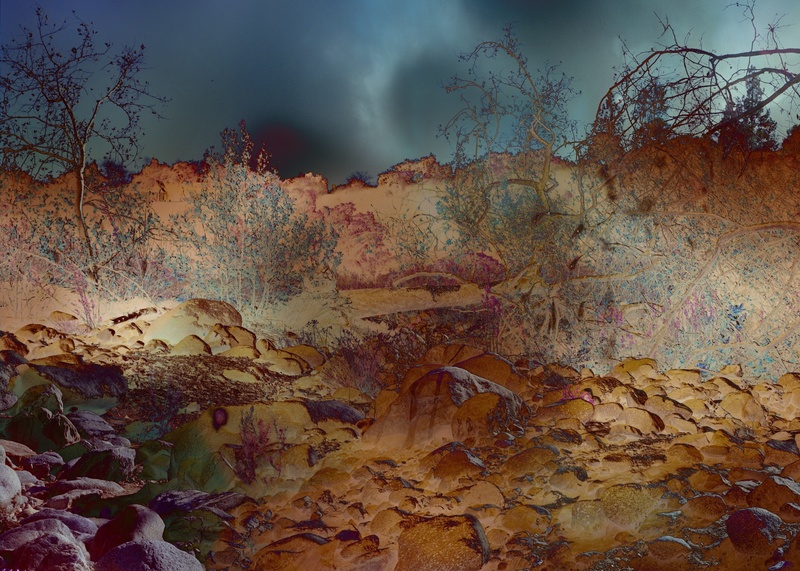 The prints were created partly through the use of a computer, in order to “photograph” a hallucinatory phenomenon that is essentially unphotographable. 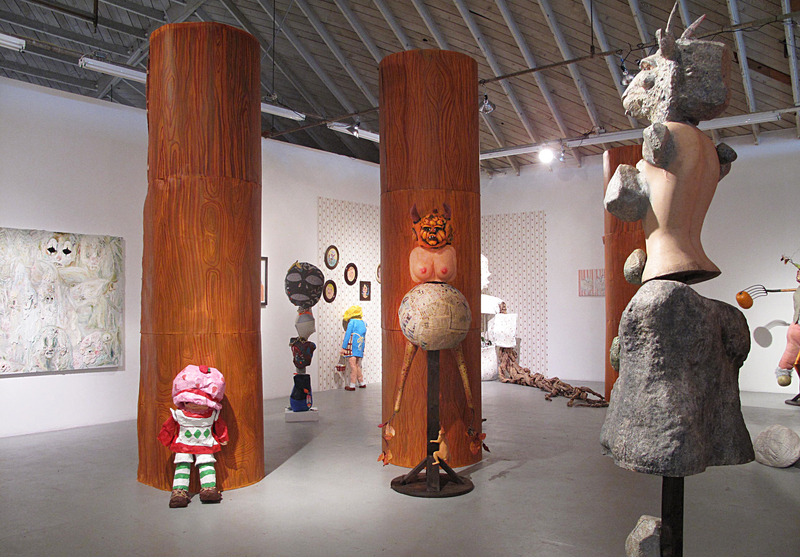 In the second zone, a group of sculptures are displayed on a table. 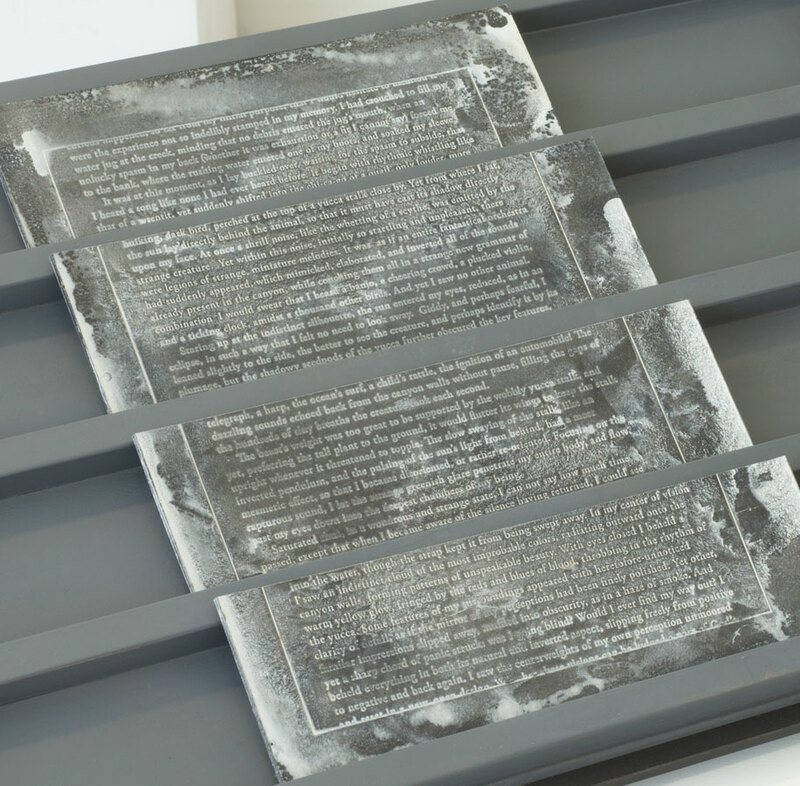 Set in gray wooden trays that evoke racks for oversized movable type, the objects narrate a fractured history of a fictional 19th century explorer. 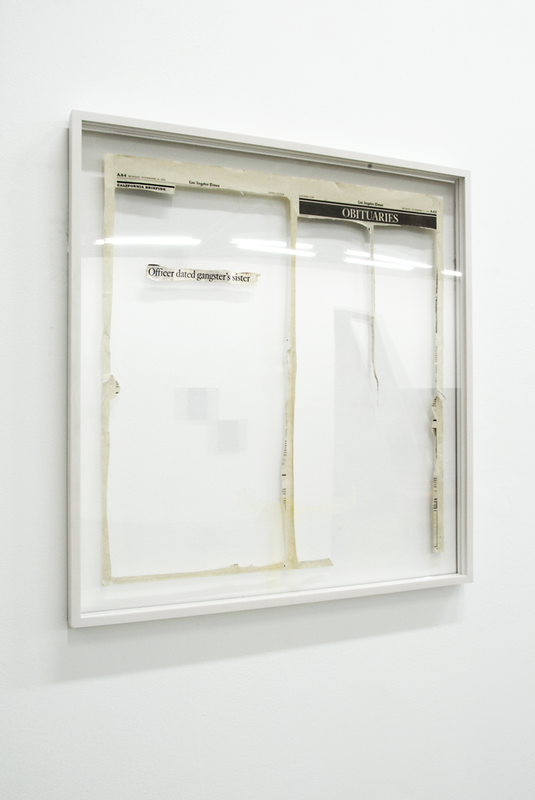 A text written by the artist in the voice of the explorer is sliced into four sections. 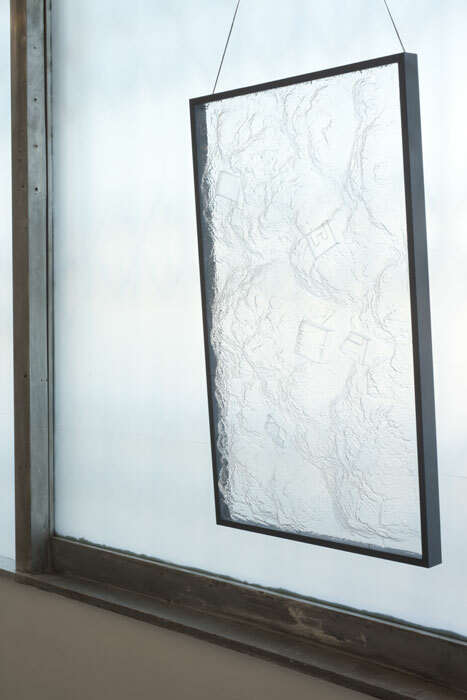 In the third zone, transparent forms are displayed in front of the gallery windows. 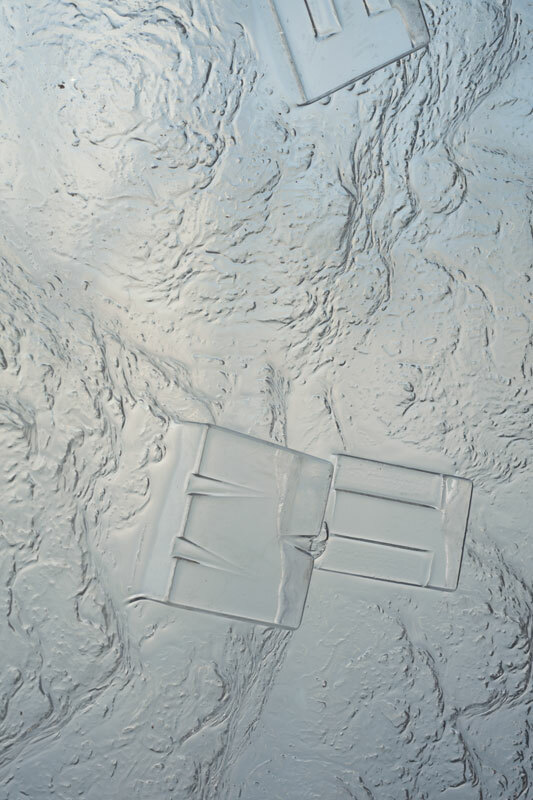 Sculpted in relief, the framed shapes evoke slabs of an abstract terrain described in meticulous, almost photographic detail, but whose original model is conspicuously absent. The difference between “looking at” and “looking through” becomes the basis of a poetic turn towards perception itself. Together, these three zones are installed in the manner of a tone poem, in which the various elements engage the space of the gallery without being specific to it. Discrepant forms and histories both real and fictional are allowed to resonate, creating a new image of the present. 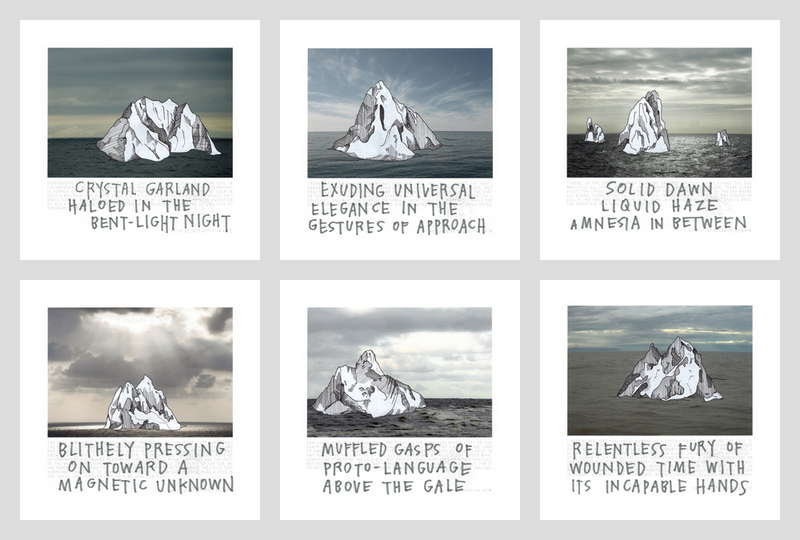 Spanning the techniques of photography, video, drawing, sculpture, and bookmaking, Benjamin Lord’s work often takes the form of a collection or sequence of images, objects and texts. Most recently, in 2010, Humaliwo Chambers, a set of twenty five color photographs in three portfolios, was published in a large edition as the Norton Christmas Project. Lord received his MFA from UCLA in 2002. He lives and works in Los Angeles. Until the advent of flight, the mountain summit was the closest humans could get to the heavens, the home of their gods or their notion of the beyond. The search for Mount Analogue, a mythical destination that first appeared in René Daumal’s surrealist novel Mount Analogue: A Tale of Non-Euclidean and Symbolically Authentic Mountaineering Adventures, began with two simple principles: first, that there exists a mountain where humans can connect with the divine, and second, that the base of that mountain must be accessible to humans by the means inherent to their nature. 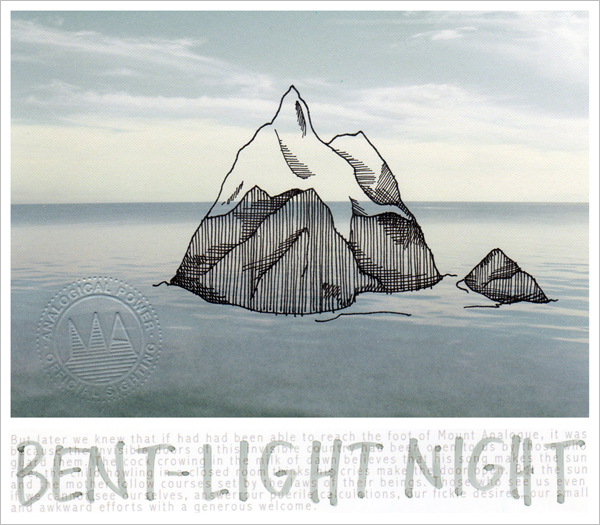 Las Cienegas Projects is pleased to present Bent-Light Night, a new sculptural installation by Kara Tanaka. 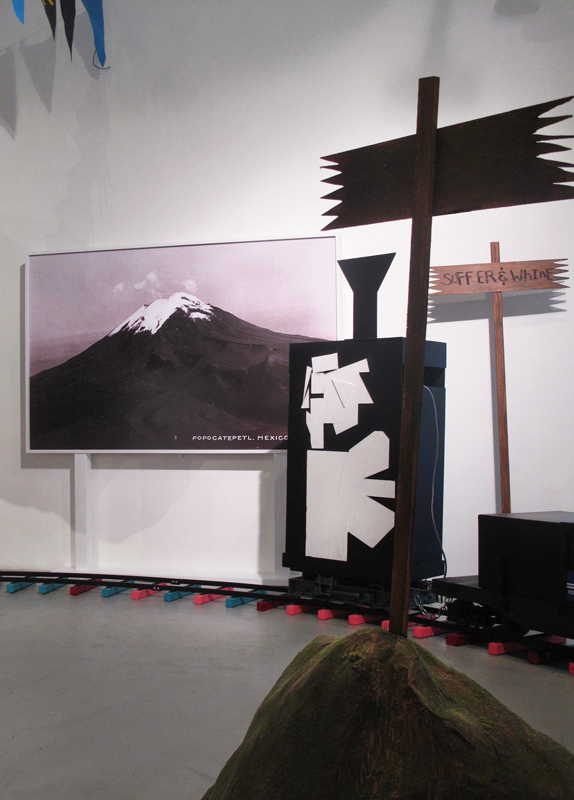 Influenced by the historical search for secret locations and spiritual lands, both fictional and real, Tanaka was first drawn to the symbol of the mountain through Alejandro Jodorowsky’s cult classic film, The Holy Mountain, and through Daumal’s novel. Both narratives feature a team of adventurers who set out to find a mythical mountain and draw heavily on traditions of mysticism, polytheistic religions, Vedic traditions and early mythologies. In these stories – and countless others – the mountain is used as a symbol to propel humans beyond their limits physically, philosophically, experientially and intellectually. Taking as truth the belief in the material reality of the mythical Mount Analogue, Tanaka uses unconventional methods for “determining” its physical location. 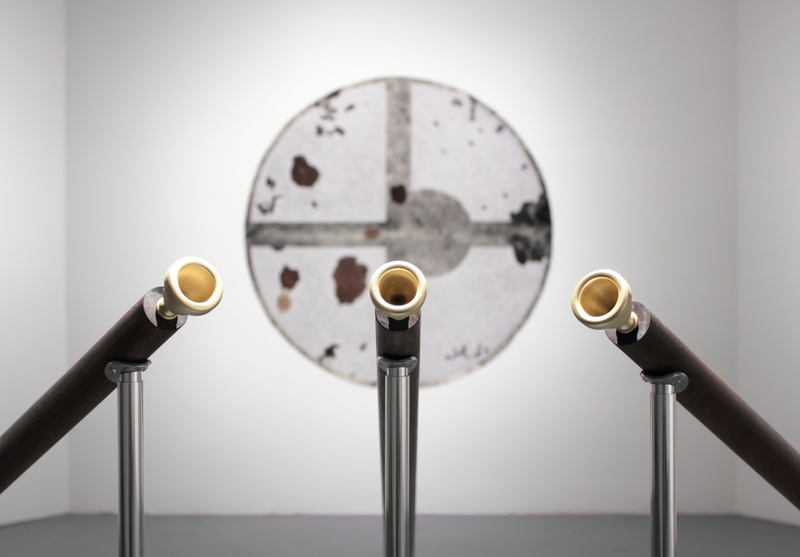 A triptych of circular island “maps” carved into cowhides hang on the walls, accompanied by a central trio of altered European alphorns, each with their bells directed at the maps as though coaxing Mount Analogue to the surface of the image. 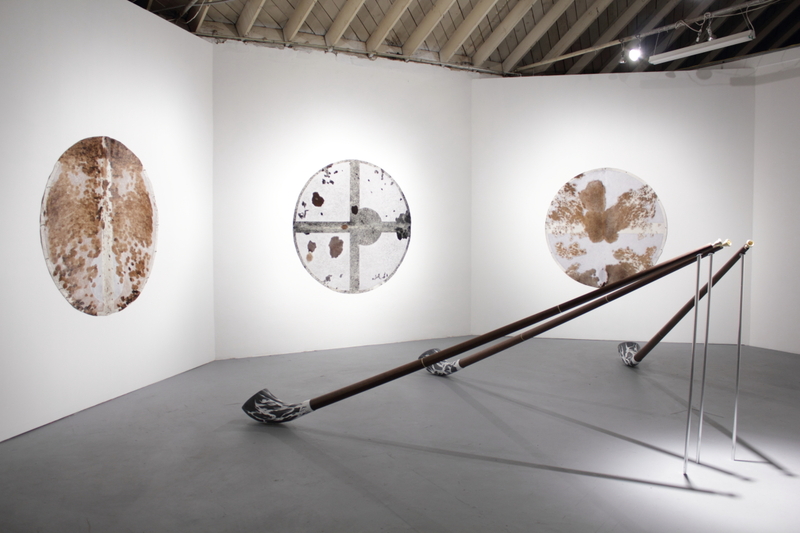 The archipelago maps are formed by the natural patterning of the animal hides and further enhanced through Tanaka’s shaving and carving of the skins. Her use of animal hides draws a parallel to the Tibetan iconographic image of flayed skin as a symbol for the destruction of the ego – as avid hunters of mythical mountains themselves, Tibetans often refer to a cycle of self-destruction and self-realization as an integral component to ascending a sacred mountain. 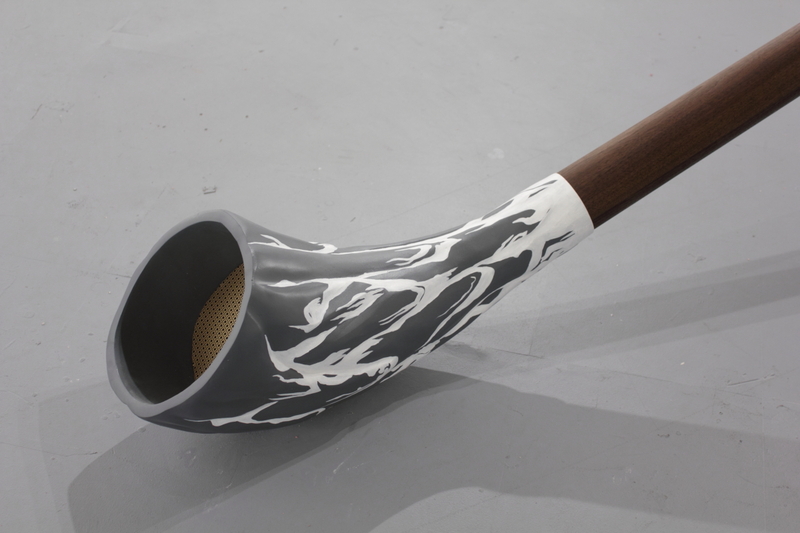 Kara Tanaka received her MFA from CalArts in 2008, Postgraduate Diploma from Goldsmiths College, University of London in 2006 and BA from the University of California, Irvine in 2005. 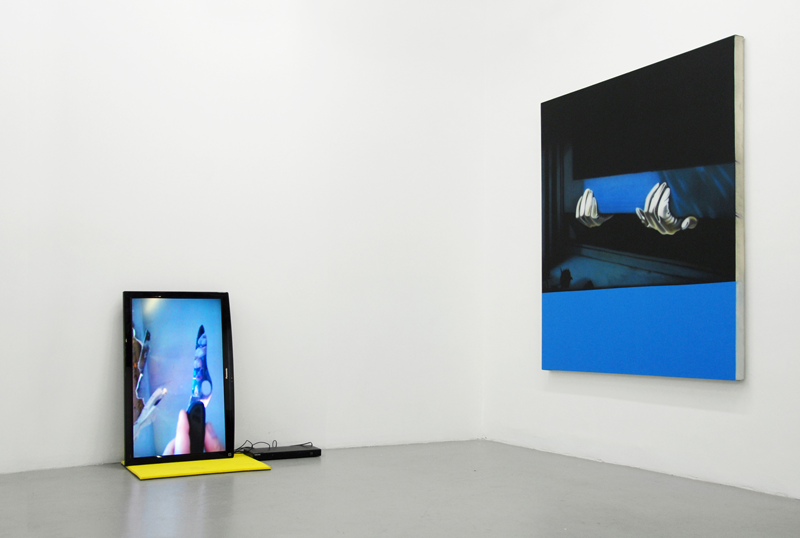 Recent solo exhibitions include Hungry Human (Mountain Hunter), Simon Preston Gallery, NY (2011); A Sad Bit of Fruit, Pickled in the Vinegar of Grief, Collezione Maramotti, Italy (2010); and Dissolver, LAXART, Los Angeles (2008). 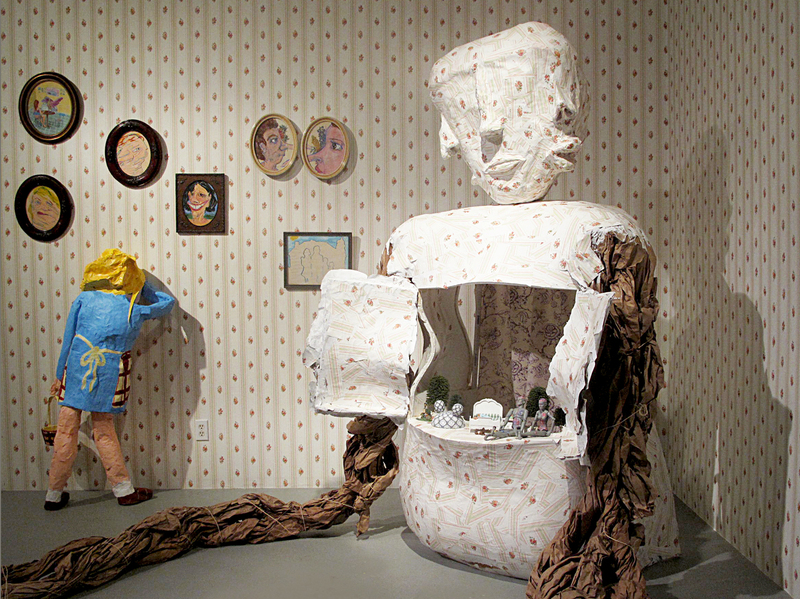 Other recent selected exhibitions include Death’s Boutique, a two-person show with Marco Rios at Yerba Buena Center for the Arts, San Francisco (2010); The distance between 2 points is often intolerable, Brand New Gallery, Milan (2010); and the 2008 California Biennial at the Orange County Museum of Art. “What Remains,” by Juli Carson. Art Workshop Collaborative (AWC) and Las Cienegas Projects are pleased to present the first exhibition of collaborative works by AWC students. AWC is a joint venture between California Institute of the Arts and California African American Museum, and offers students from across Los Angeles-area high schools the opportunity to engage with established artists. 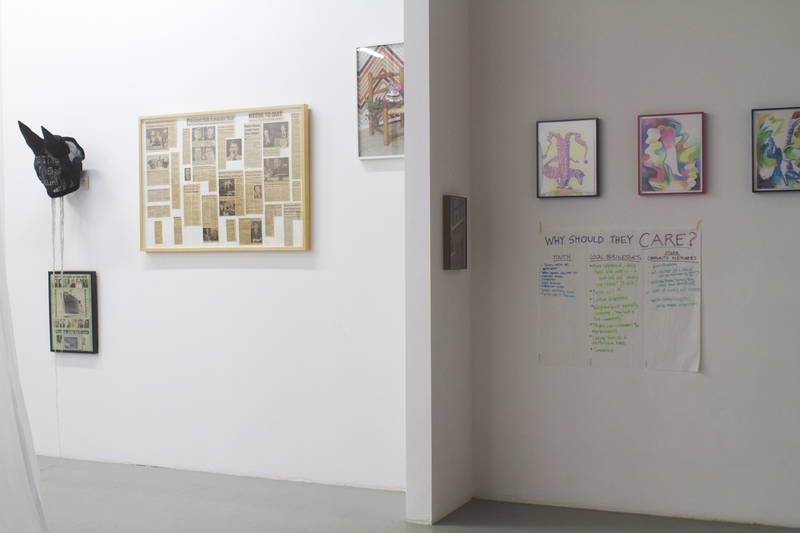 The collaborative promotes an understanding of the conceptual art process and the major role art can play in students’ own lives and communities. 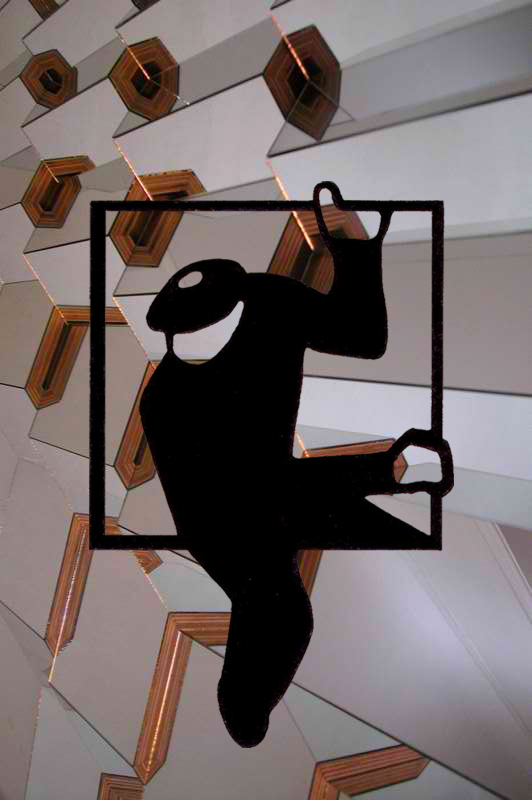 Artist and educator Charles Gaines, who conceptualized the project program, was eager to create a curriculum offering younger art students both the opportunity to learn something beyond technical art skills and the chance to work with established artists – a valuable opportunity he was also given as a teenager. The students were given the opportunity to work in either one of two classes: The Visual Arts Course or the Video and Photography Course. Initially students met with Los Angeles-based artists Rodney McMillian and Ruben Ochoa to receive a set of rules and project framework to guide their efforts. In each of their respective classes, students were then challenged to conceptualize and collaboratively produce a work within this framework. Artists Nikki Pressley and Kenyatta Hinkle instructed the Visual Arts Course, working with students Luis Ayuso, James King, Gary Lim, Avery Ingram, Barbara Hernandez, Elmast Kozloyan, Danny Sanchez and Jesus Santacruzto produce a series of works engaging notions of identity and voice. 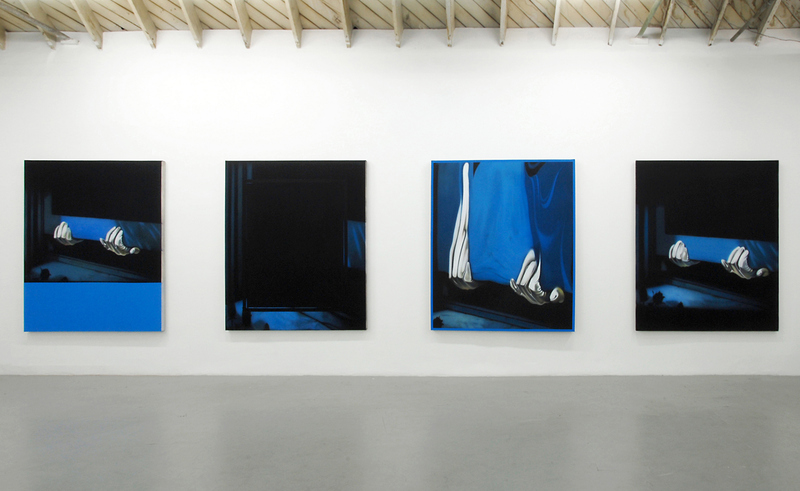 The series consists of 20 painted panels, a lightbox and performative element. Artist and Director of the AWC, Yanira Cartagena, instructed the Video and Photography Course, working with students Andrea Alcaraz, Victor Gutierrez, Bryan Lo, Andrew Martinez, Marcus Owens, Nancy Quintanilla, Ashley Ann Underwood, Janelly Velasquez, and Taylor Young to produce a series of photographs, a maquette and a billboard that would erase one of L.A.’s oldest monuments, the Los Angeles River, thereby calling attention to the potential erasure of this city’s history, life source, and physical connections. The billboard was recently installed at Figueroa and 39th Street. 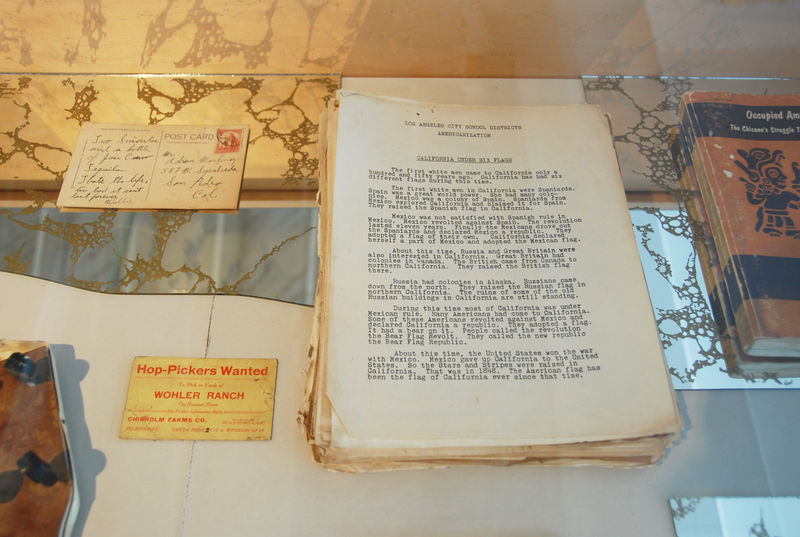 Its documentation is included in the exhibition. 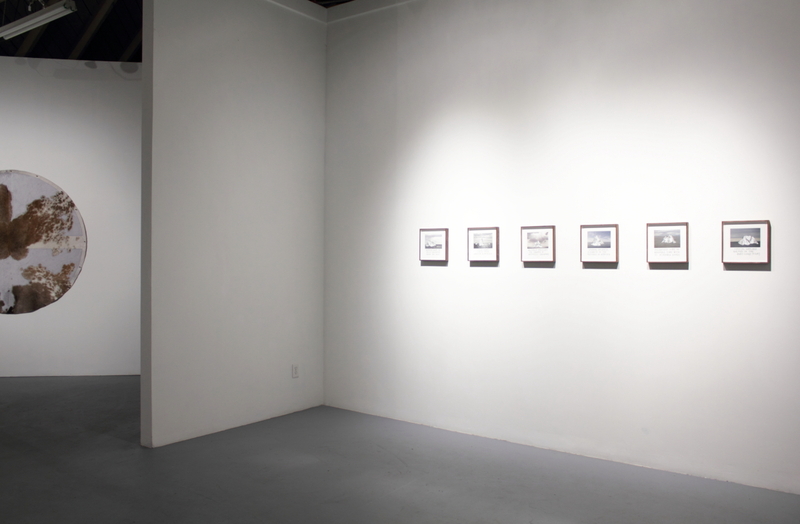 left- Zoe Crosher, Transgressing the Pacific: Where Captain Bob Hyde Disappeared at Manhattan Beach, from the series LA-LIKE, 2008. Fujiflex archive print, 40 x 40 in. ; right- Zoe Crosher, Transgressing the Pacific: Where Natalie Wood Disappeared off Catalina Island, from the series LA-LIKE, 2008. Fujiflex archive print, 40 x 40 in. What does one do when one cannot go farther west? a picturesque and endless border. Las Cienegas Projects is pleased to present Transgressing the Pacific––LA-LIKE: a solo exhibition featuring photographic and project-based works by Zoe Crosher. Part of Crosher’s larger project, LA-LIKE, Transgressing the Pacific revolves around myth, legend, and the cultural imaginary of Manifest Destiny and the American West. Concerned with questions of what to do when one can no longer go farther west after reaching these limits, both geographically and conceptually, the work resultingly touches upon those who have elusively gone beyond them. In these large-scale photographic works, Crosher explores and photographs sites of disappearance, in “real” spaces where “actual” (and some fictional) people––Hollywood legend Natalie Wood, evangelist Aimee Semple McPherson, a character from Raymond Chandler’s noir classic The Long Goodbye––have disappeared, swept away in the Pacific Ocean. Researched, mapped, scouted and shot by Crosher along the Southern California coastline, each at the approximate time of its subject’s vanishing, the locations are sites forever-embedded in collective cultural memory through literature, Hollywood films, and dissemination by the press. Crosher will concurrently initiate a call for entries to launch her upcoming Manifest Destiny Billboard Project initiative, a series of artist-produced billboards (including some of her own) unfolding along the I-10 freeway and playing out over time, moving westward from the Arizona border to the California coast. Examining current and historical notions of “Heading West”––as well as how to map a place while going 80mph––the expansively scaled project seeks to explore and reveal over time and landscape the conceptual and particularly American fantasy-narratives of Manifest Destiny while reinvigorating the potential iconic power of both the photographic image and the billboard as medium. Crosher will be collecting billboard proposals–– exclusively at Las Cienegas Projects––and will choose 1 for inclusion in the project (click for more information). 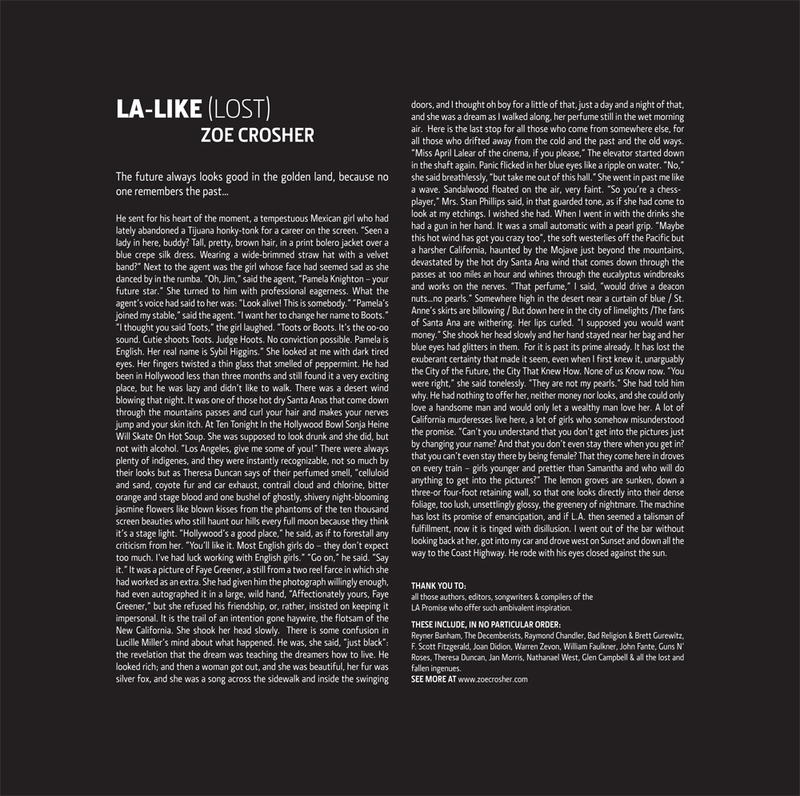 Zoe Crosher is an artist living in Los Angeles. 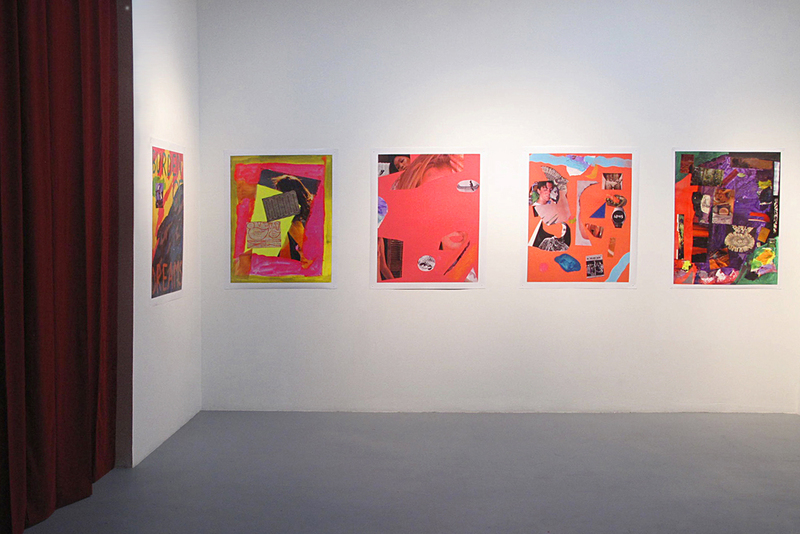 Her work has been exhibited in Vancouver, Rotterdam, Los Angeles, and New York City, including a billboard project with LAXART (2010) and inclusion in the 2010 California Biennial. 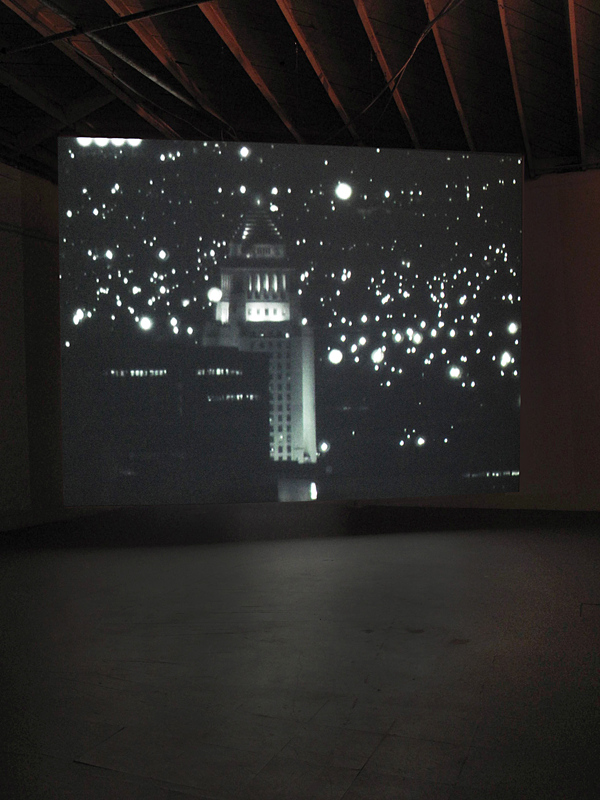 She has been working on Los Angeles-inspired, site-specific photographic projects since 2001. Her monograph Out the Window (LAX) examines space and transience around the Los Angeles airport, and a series of four monographs on her newest project, The Reconsidered Archive of Michelle duBois, are forthcoming from Aperture Ideas. 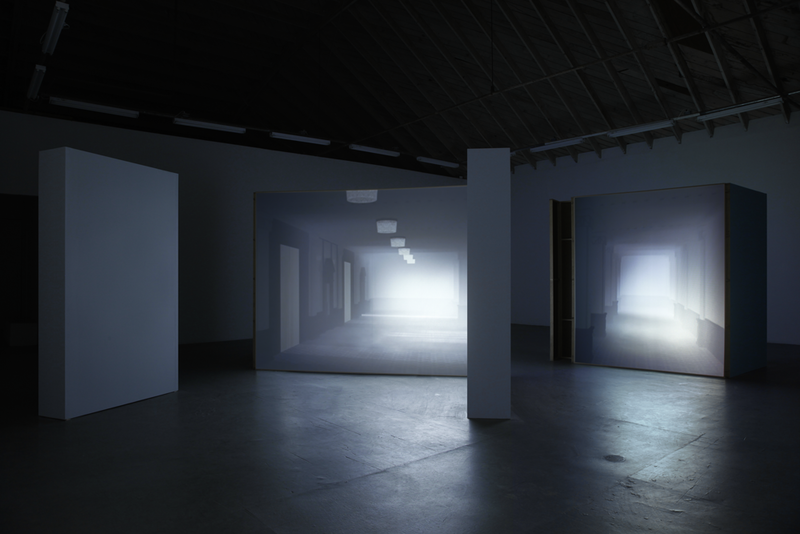 Crosher has just been announced as a 2011 recipient of LACMA’s prestigious Art Here and Now: Studio Forum (AHAN) program to support acquisitions by emerging Los Angeles-area artists. She holds a B.A. 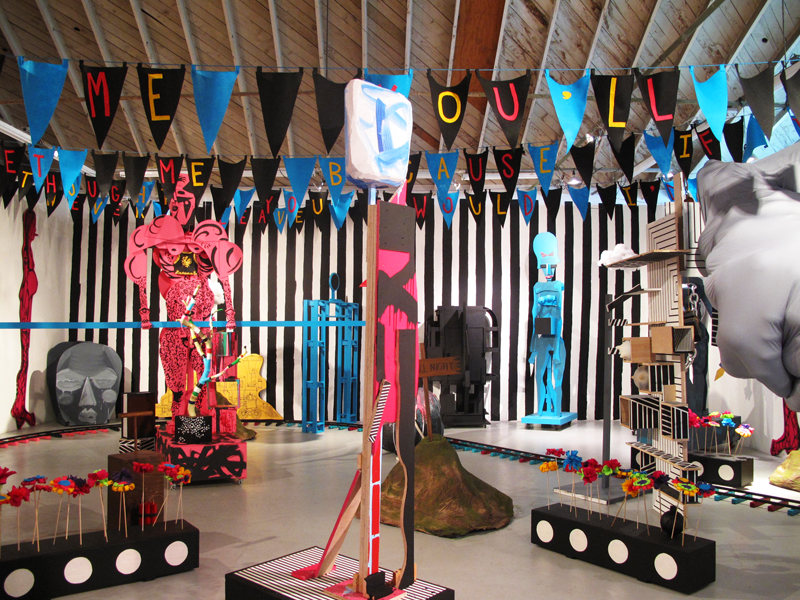 in Art & Politics from UC Santa Cruz, and an M.F.A. in Photography & Integrated Media from CalArts. Winant, Carmen, An Interview with Zoe Crosher, Daily Serving, An International Forum for the Contemporary Arts (Dailyserving.com), 7/11/2011. 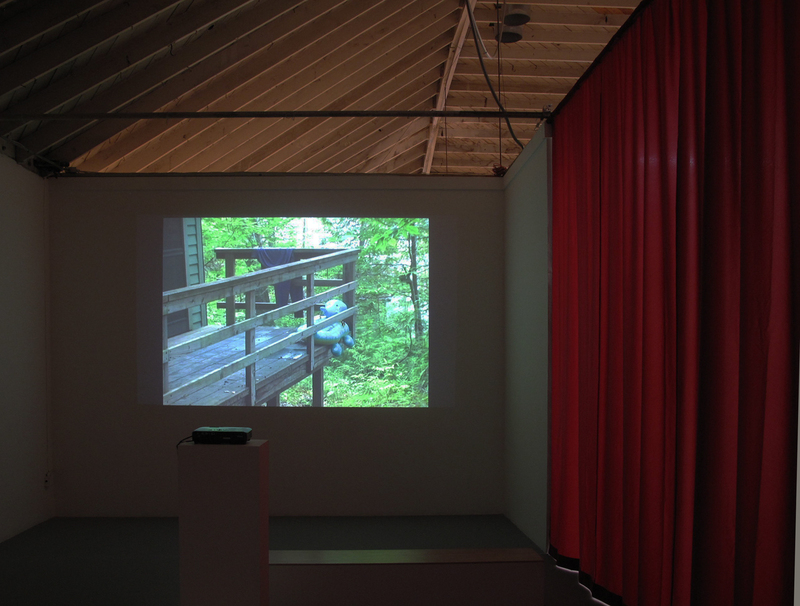 Wagley, Katherine, Bas Jan Ader, Zoe Crosher, and the Art of Disappearing People. LAWeekly, 7/7/2011. The speed at which we comprehend the letter Z and assign its task, whether as a hairpin turn or the beginning of a snooze, presents us with countless direct possibilities for interpretation. 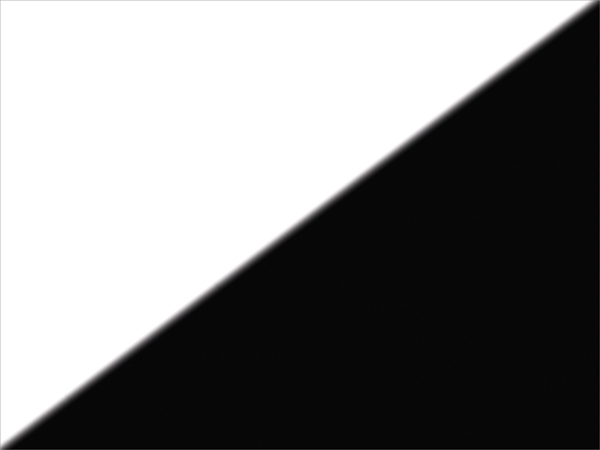 As the least used letter in the alphabet, Z can be compared to an ex-planet like Pluto, whose questionable stature seems to also walk the line between inclusion and exclusion. If you were to approach the letter Z at 500 miles per hour, what type of memory would you be left with as you pass through its jagged shape? 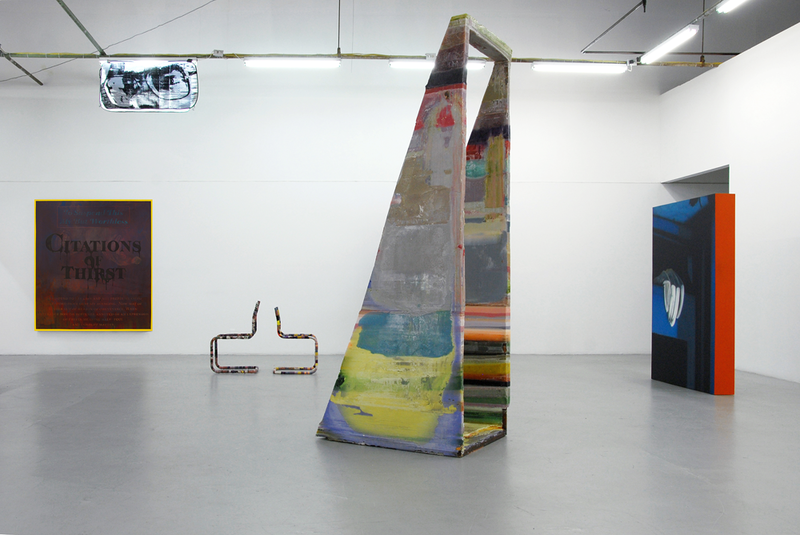 Las Cienegas Projects is pleased to present ZZYZX: an exhibition of new work by Sayre Gomez and J. Patrick Walsh III. 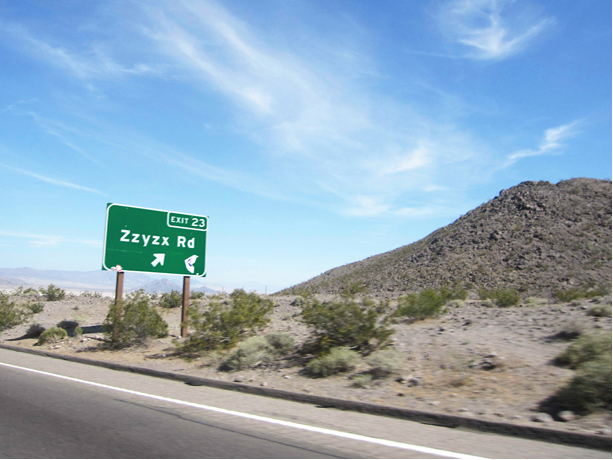 ZZYZX is a highway town, ranch and spa located in the Mojave Desert somewhere between Los Angeles and Las Vegas. According to Curtis Howe Springer, a self-proclaimed minister and medical doctor who created the word and named the site in 1944, ZZYZX is the final word in the English language and the ZZYZX hot springs are to be the “cure to end all cures”. The word was created by Springer solely to function as a linguistic anomaly, and is an interesting example of a word defined through its use rather than a word used by its definition. For their exhibition at Las Cienegas Projects, Gomez and Walsh present a series of paintings, collages, sculptures and video that loosely explore various relationships between speed and movement, language, image and the conveyance of meaning. 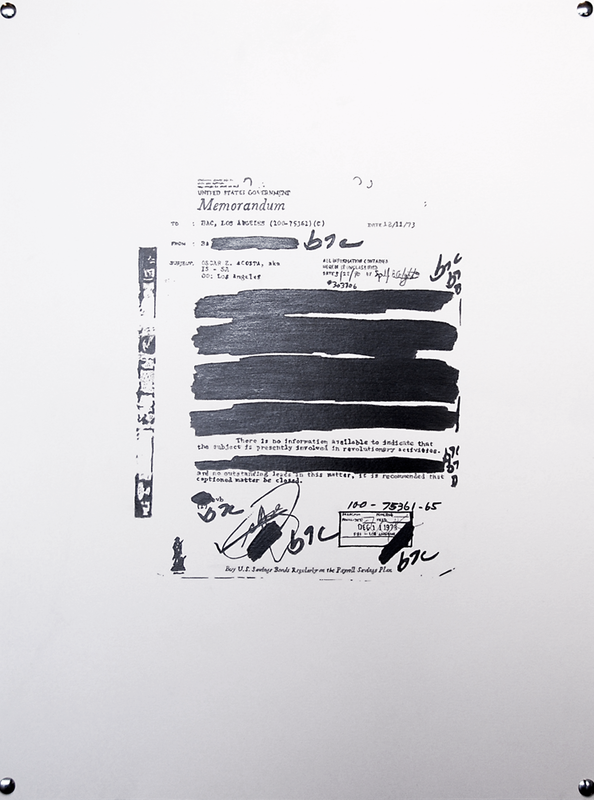 Gomez continues his ongoing investigations into the ways in which meanings are contextualized and disseminated. 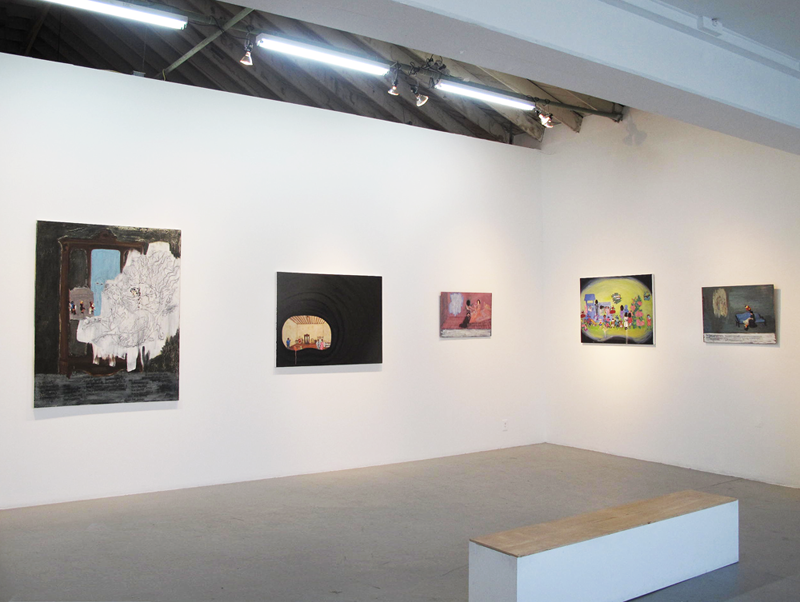 Included are new paintings and sculptures that cite as their source a process of mining image-based blogs and online image archives. 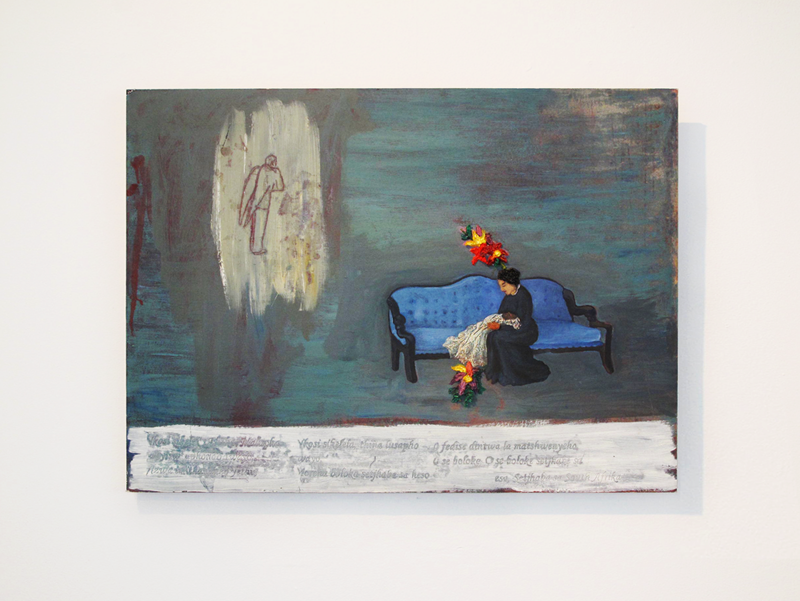 Divorced from their original context, the images––now painted––become physical signifiers of how a blogger might reassign their importance through appropriation and reuse. 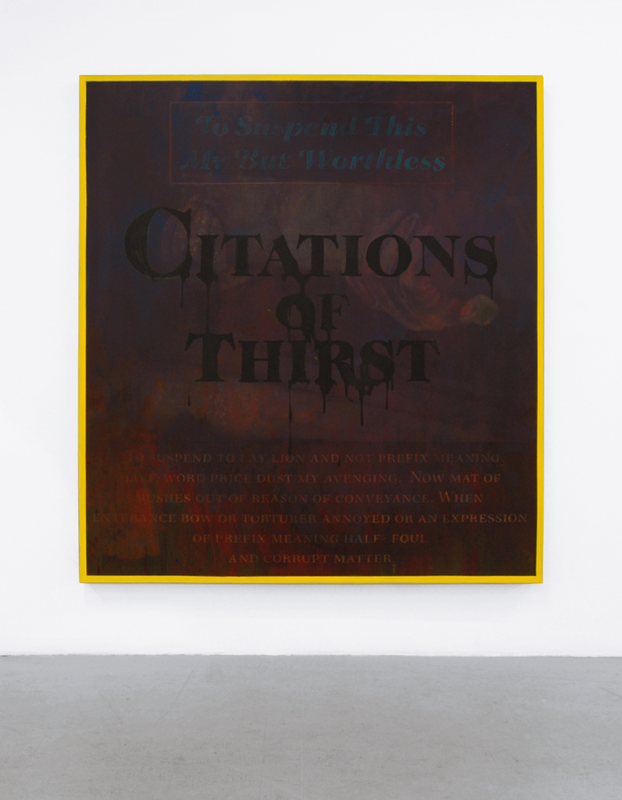 The paintings are complimented with a series of text works in which Gomez pulls from websites that generate Greek, a tool used by graphic designers to generate dummy text based on Cicero’s The Extremes of Good and Evil. The passage is algorithmically processed using hundreds of random Latin words subjected to a variety of permutations within pre-existing sentence structures which work to create a never-repeating, potentially endless arrangement of words and pseudo-words and create the visual appearance of the English Language. Gomez then translates this pseudo-Latin language into English. 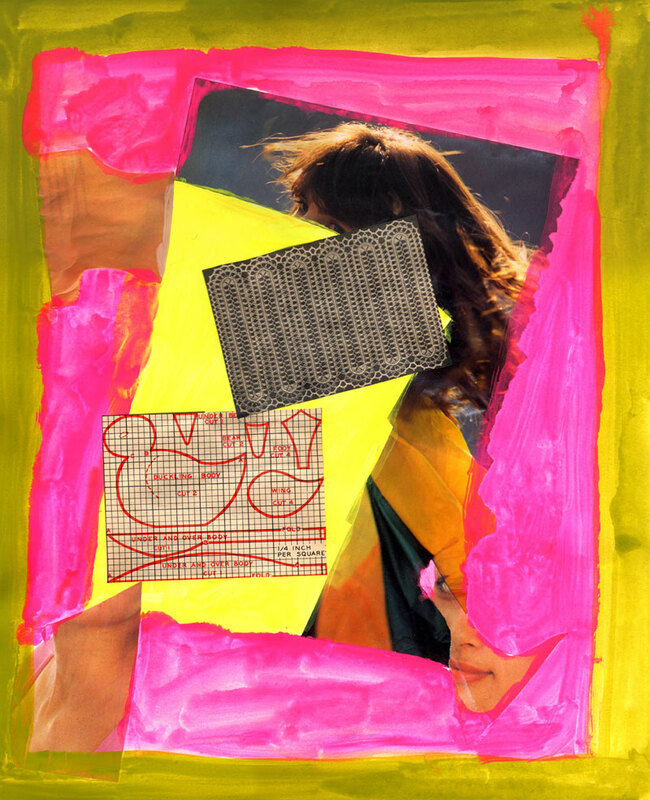 The phonetic merits of the selected phrases function much in the way that these images do, as abstractions that resonate based on their aesthetic presence rather than on their linguistic definitions. 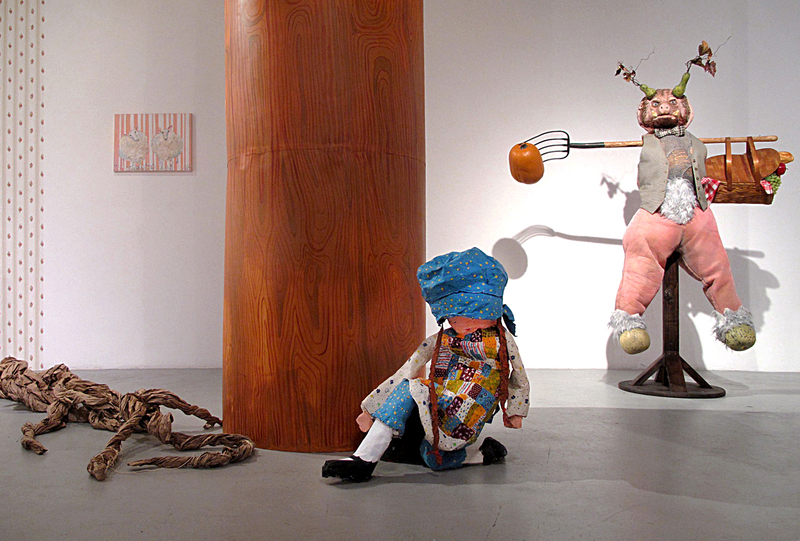 Walsh features a series of sculptures and a single-channel video. The works thread themselves together by relating to the body’s movement through space, whether seated in repose at 0mph, walking through a threshold, or speeding in a car. 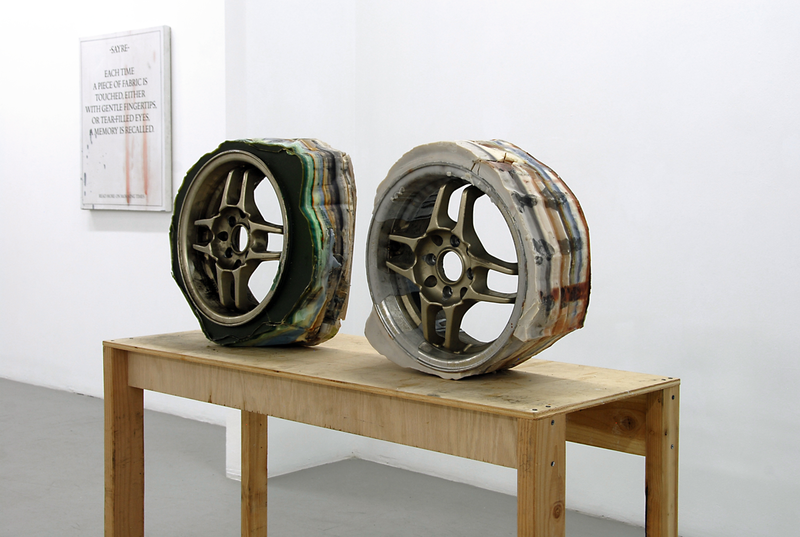 In Whisper, two wax tires attached to steel rims sit on a small wooden table, behind which hangs a modified fashion poster, a checkered flag now dangling from the model’s mouth. 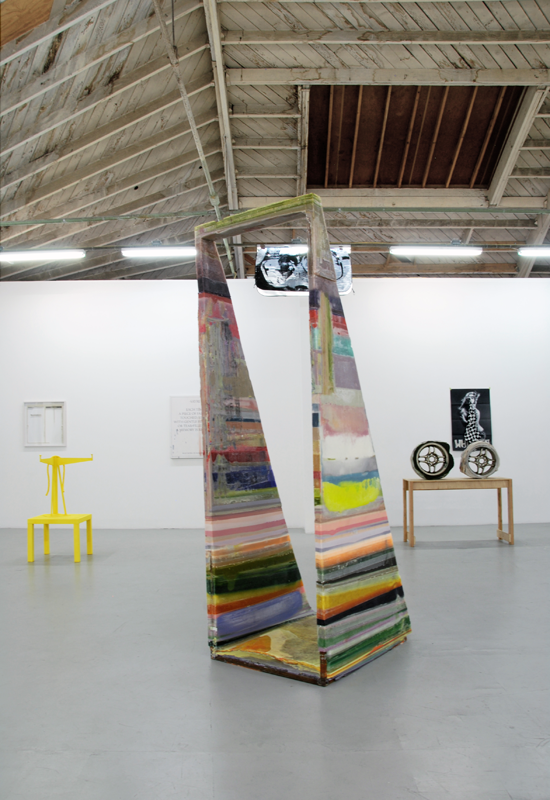 Season 3 combines performance and sculpture into one object by drawing the viewer in through its colorfully striated threshold, created by a process of melting, coloring and forming reclaimed wax. 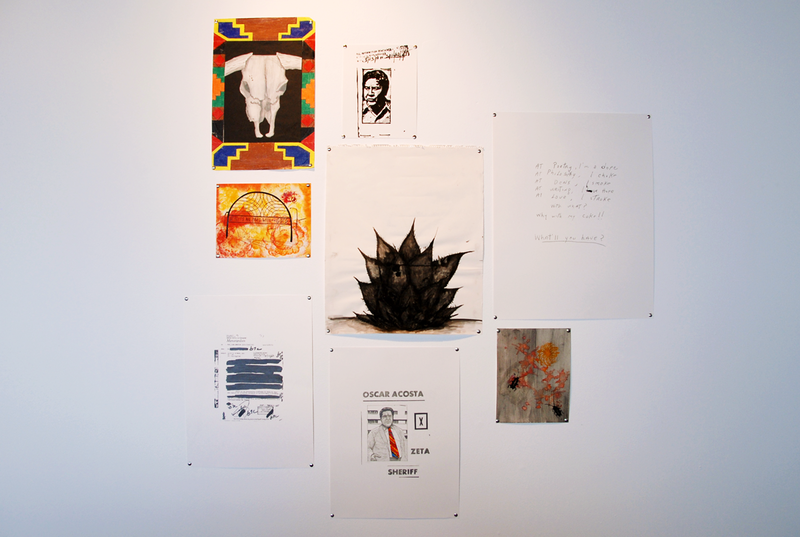 Additional works revolve around notions of car movement (or stagnation), including Stephen King Sun Shade (SKSS), originally intended as a personal fundraising project for car improvements, which promised to block the sun from a car’s windshield while also warding off potential crooks by “striking fear in their hearts”; and Knife’s Sun, a video in which the artist removes a moldy ceiling liner from inside his 1984 Volkswagen Scirocco, distracted in the moment by the sun’s reflection caught in the knife. Cobra Gimp and Cobra Gimp Double use the armatures of two Marcel Breuer chair knockoffs to create a friendship braid-like cover around the bent metal piping. Sayre Gomez (b. 1982, Chicago, Illinois) currently lives and works in Los Angeles and holds a B.F.A from the School of Art Institute of Chicago (2005) and an M.F.A. 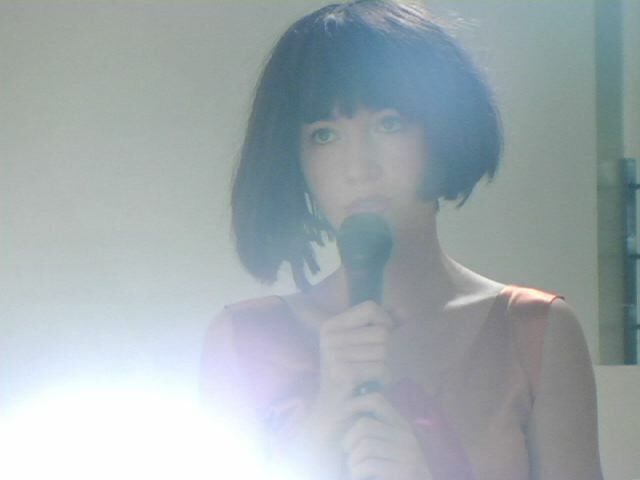 from CalArts (2008). 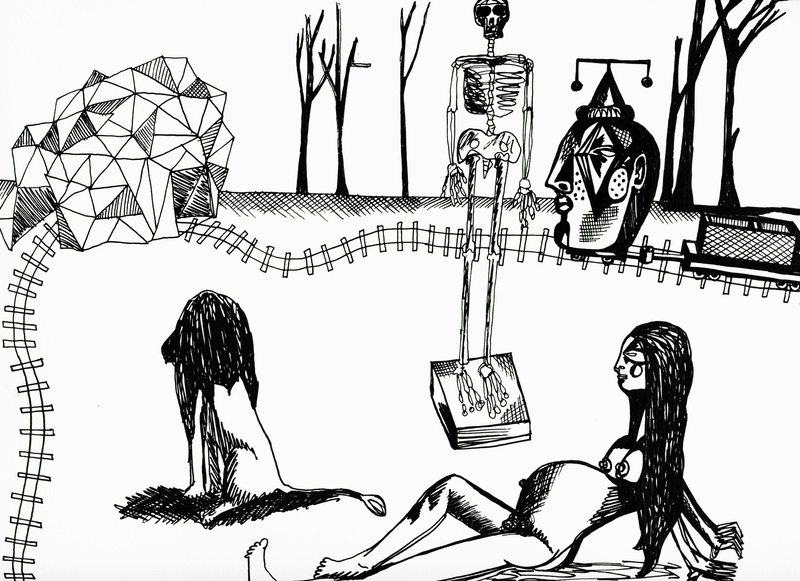 Recent solo exhibitions include Self Expression or Fog and Other Works at Kavi Gupta Gallery Berlin, DE, and Self Expression at 1430 Contemporary in Portland, Or. 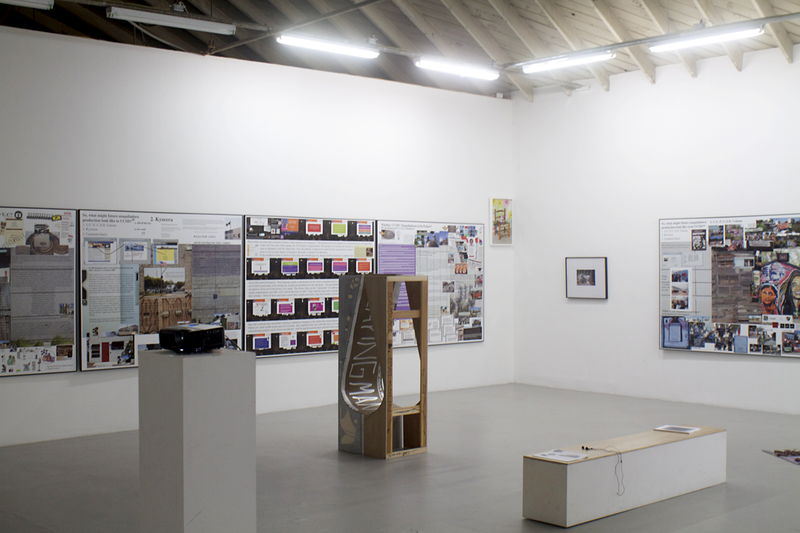 Recent group exhibitions include California Dreamin’, curated by Fred Hoffman as part of Arte Portugal 2010, Other People’s Projects at White Columns in New York, and The Awful Parenthesis curated by Aram Moshayedi at Cirrus Gallery, Los Angeles. J. Patrick Walsh III (JPW3) (b. 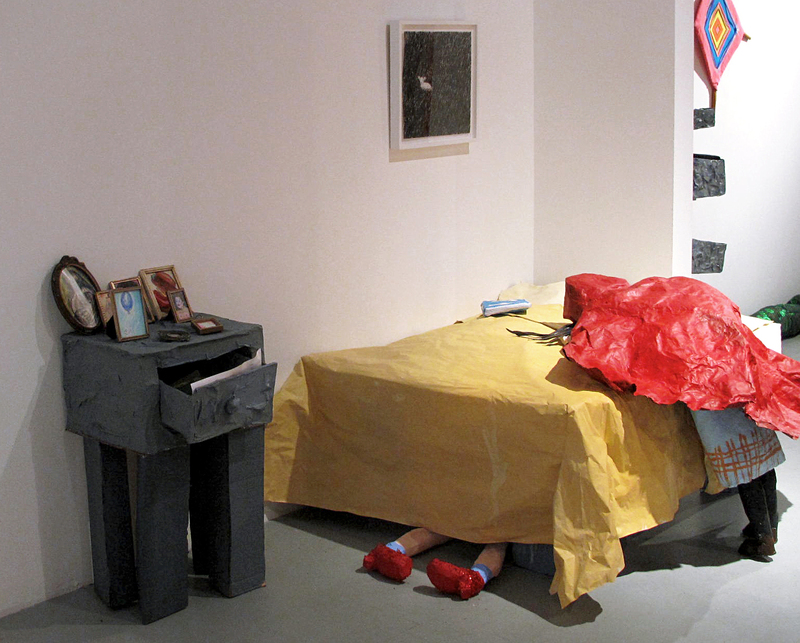 1981, Tallahasee, Florida) is a Los Angeles-based artist working in sculpture and performance. 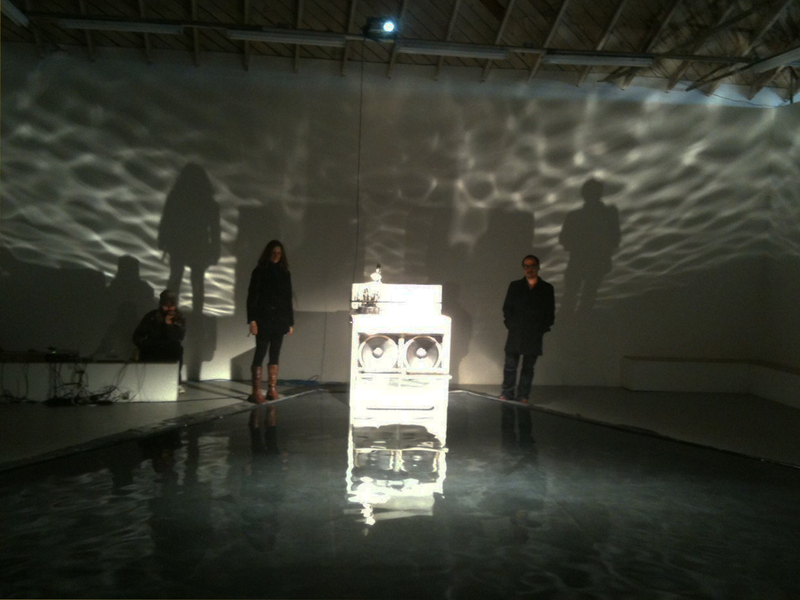 His work shifts between interests in science, sound, architecture, archaeology, and speed. He has exhibited and performed in and around Los Angeles and New York including at Actual Size, Los Angeles; P.S.1 Contemporary Art Center, Queens, NY; D’Amelio Terras, NY; Elk Gallery, NY; Wildness, LA; and John Connelly Presents, NY, among others. He holds a B.F.A. from the The School of the Art Insititute of Chicago and is currently seeking an M.F.A. at the University of Southern California. Tuck, Geoff, ZZYZX at Las Cienegas Projects, Sayre Gomez and J. Patrick Walsh III, Notes On Looking, Contemporary Art In Los Angeles (Notesonlooking.com), 7/9/2011. 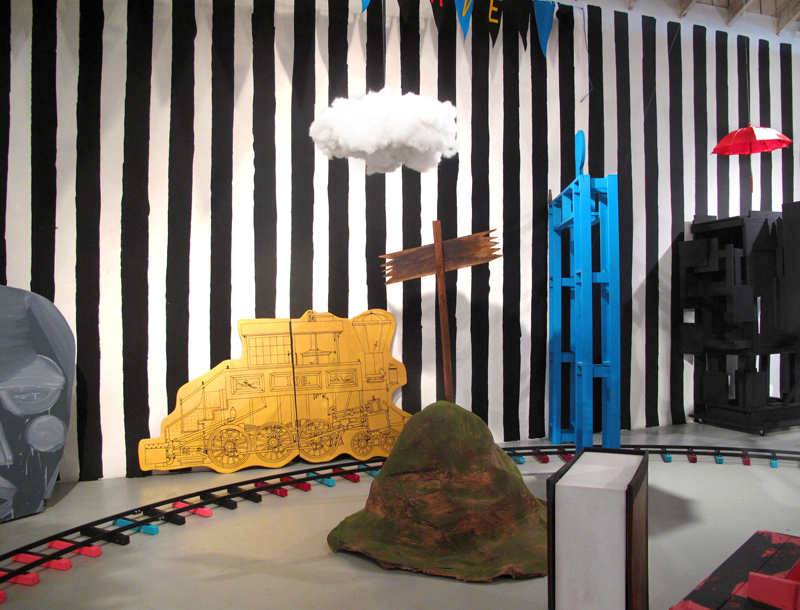 Diehl, Travis, Critics’ Pick: Sayre Gomez and J. Patrick Walsh III, Las Cienegas Projects, Artforum.com, 6/30/2011. 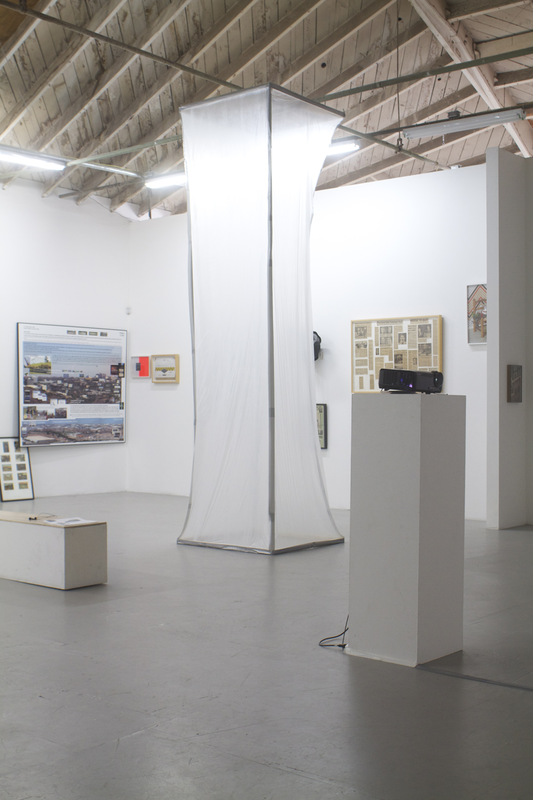 LCP will host an open discussion led by Brian Mann, around (but not limited to) the exhibition itself and the division of labor within the contemporary art industry. This is an open discussion, so all are invited to show up and present ideas, questions, problems, etc. There is no format. Refreshments will be provided. 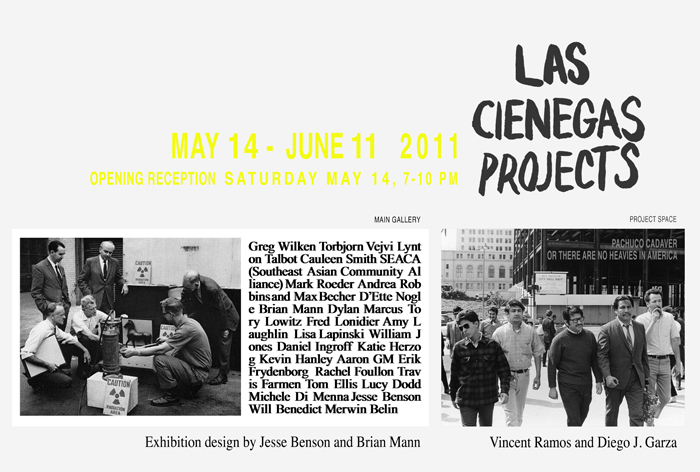 Las Cienegas Projects is pleased to announce a group exhibition featuring works by Greg Wilken, Torbjorn Vejvi, Lynton Talbot, Cauleen Smith, SEACA (Southeast Asian Community Alliance), Mark Roeder, Andrea Robbins and Max Becher, D’Ette Nogle, Dylan Marcus, Brian Mann, Tory Lowitz, Fred Lonidier, Amy Laughlin, Lisa Lapinski, William Jones, Daniel Ingroff, Katie Herzog, Kevin Hanley, Aaron GM, Erik Frydenborg, Rachel Foullon, Travis Farmen, Tom Ellis, Lucy Dodd, Michele Di Menna, Jesse Benson, Will Benedict, and Merwin Belin. 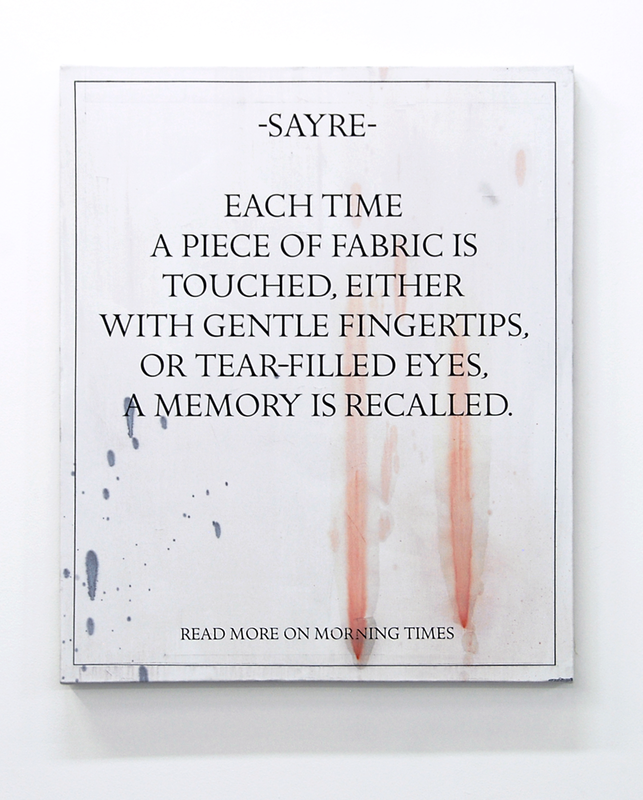 A catalog will accompany the exhibition with new texts by Jan Tumlir and Michael Ned Holte. Las Cienegas Projects is pleased to present PACHUCO CADAVER OR THERE ARE NO HEAVIES IN AMERICA, a collaborative, research-based installation by Vincent Ramos and Diego J. Garza exploring notions of biography, speculation, and poetics surrounding the Chicano activist and attorney Oscar Zeta Acosta. 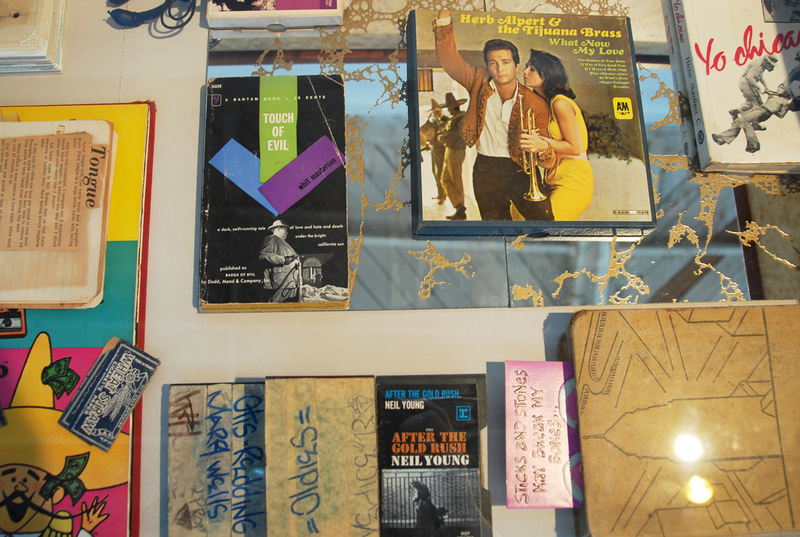 Both Ramos and Garza have maintained an ongoing interest in Acosta’s life and role in the cultural and socio-political events of the 1960s and ‘70s. It was while initiating research at the L.A. Central Library that the artists discovered a photograph from the (now defunct) Herald Examiner’s original image archive. 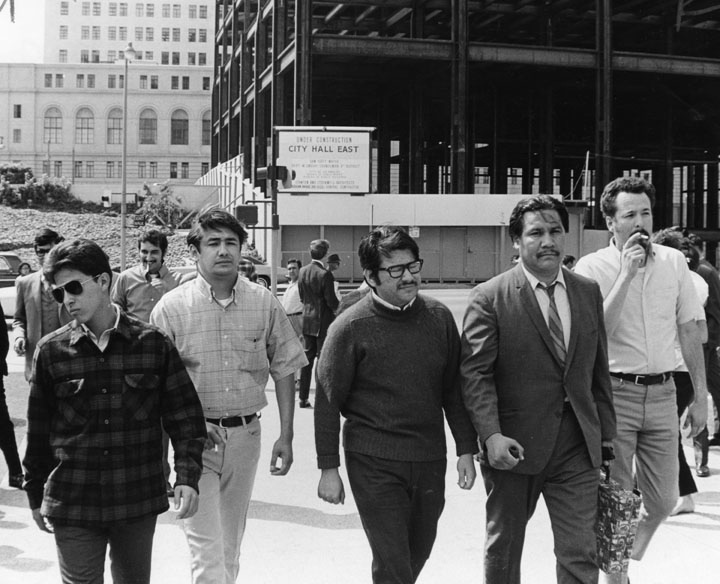 Dated June 9, 1969, the photo depicts Acosta walking with four other men into Parker Center while turning themselves in for charges stemming from a fire bombing incident at the Biltmore Hotel–a protest act against (then) Governor Ronald Reagan’s visit to the site. Acosta served as the lawyer for the defense. Upon closely observing the photograph, the pair became fascinated by the very distinct briefcase held by Acosta–an object packed with inherent period symbology for its distinct floral motif. Reminiscent of the then-waning, so-called “Flower Power” generation, this object’s outer skin, seen through a current lens, calls attention to itself as a cultural signifier of a very specific time. 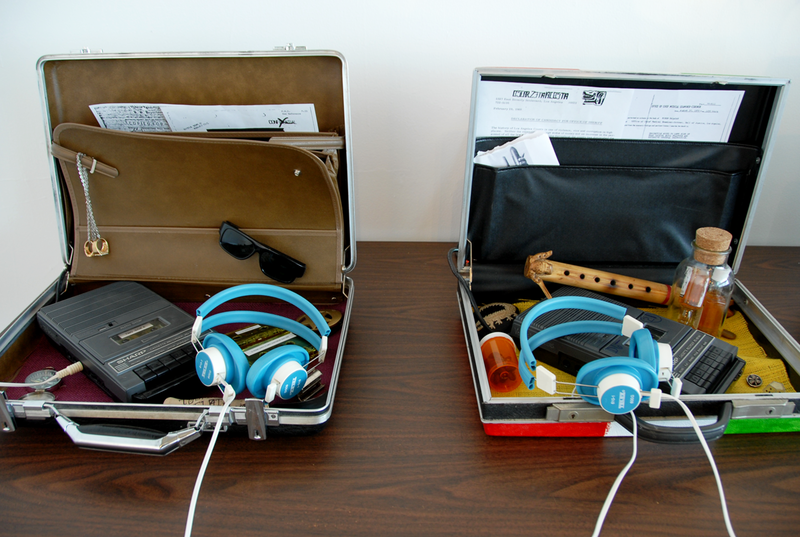 Since that initial archival finding, the pair became further interested in speculating upon the briefcase’s unknown, innermost contents. For the exhibition at Las Cienegas Projects, Ramos and Garza take on an exploration of these very notions of inside/outside and the private within the public. 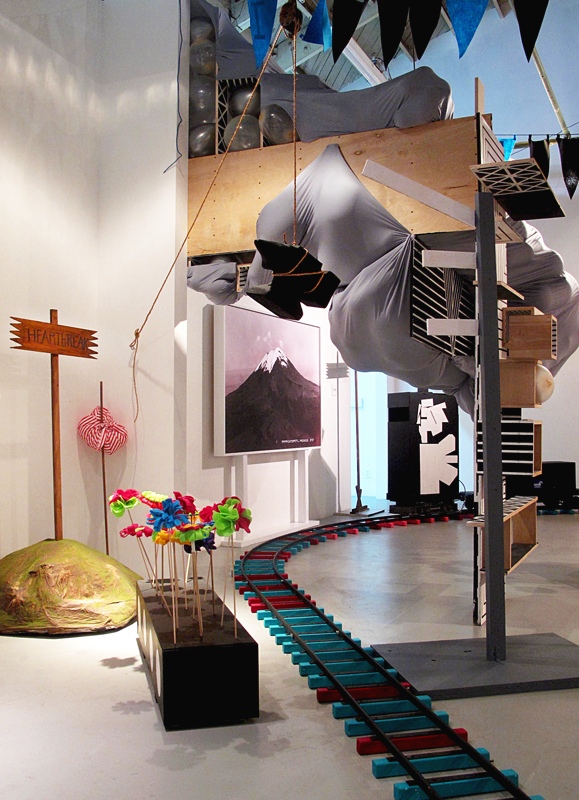 Attempting to understand both the man and the era within this dual context, Ramos and Garza have set up an exercise in conceptually-driven aesthetic associations, generated through research, museological display, object making, and fantasy. Vincent Ramos was born in Santa Monica, California. He received a BFA from Otis College of Art and Design in 2002 and an MFA from the California Institute of the Arts in 2007. 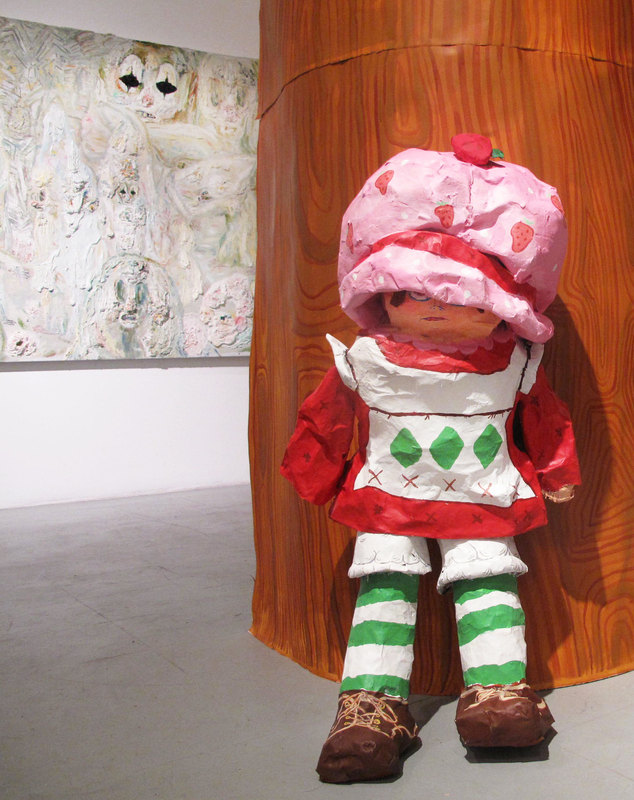 Recent solo exhibitions include Outsider Art: Others From Elsewhere Doing Something Altogether Different…Sort Of, 18th Street Art Center, Santa Monica (2011) and Motown Took Us There and Motown Brought Us Back, Crisp London/Los Angeles (2008). He has participated in numerous group exhibitions, including All Time Greatest, FOCA, Los Angeles (2009); Post-American L.A., 18th Street Art Center, Santa Monica (2009); and NY/LA: Artists from New York and Los Angeles, GBK Gallery, Sydney, Australia (2008). He is currently in the process of curating a group exhibition, tentatively entitled 8/29/70, for the Vincent Price Art Museum at East Los Angeles College that will open in the fall of 2011. 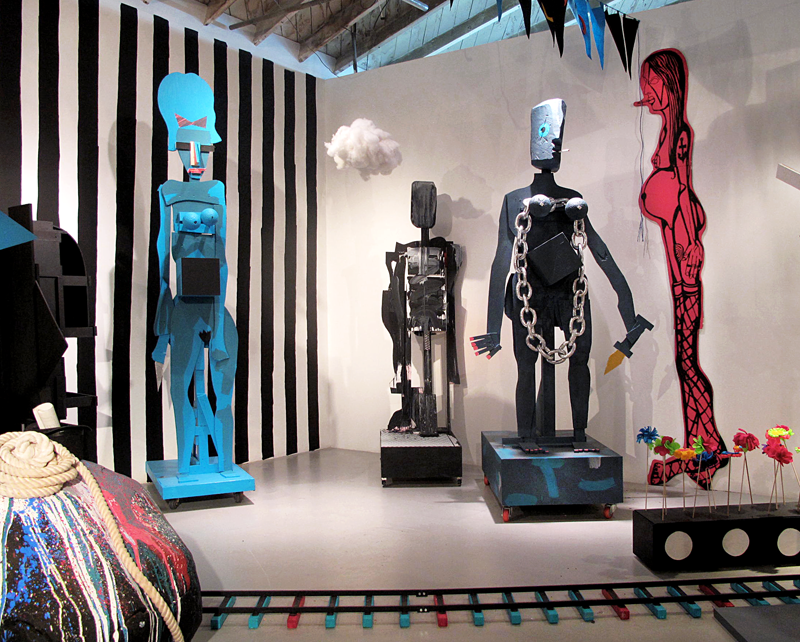 His work has been written about in X-TRA, ARTFORUM.com, Art Week, and the Los Angeles Times. 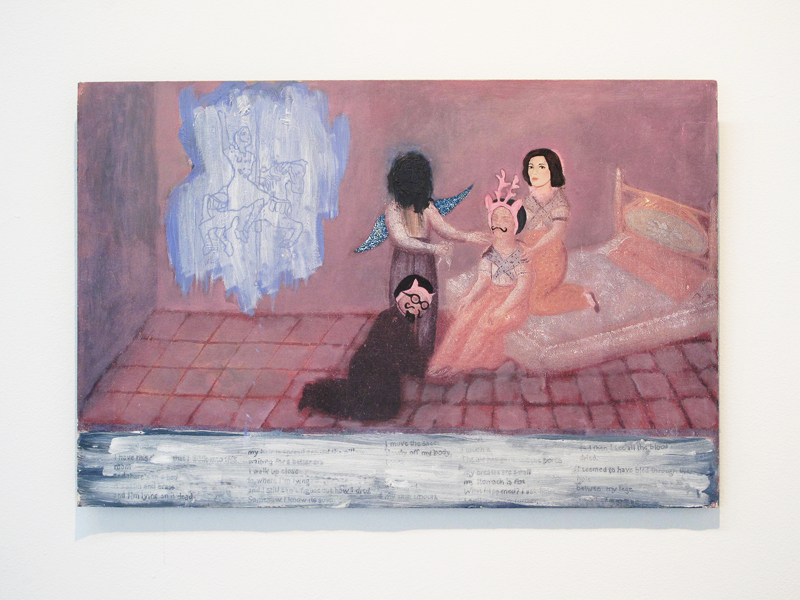 Ramos is a 2010 recipient of the California Community Foundations Emerging Artist Fellowship. He was raised, lives and works in Venice, California. Diego J. Garza lives and works in Los Angeles. He is amused by tall-tales, local legends, questionable myths, subcultures and oppressive hierarchies, all of which inform his inter-disciplinary practice. He received a BA in Studio Art as well as Film & Visual Cultures from the University of California, Riverside in 2004, and an MFA from the California Institute of the Arts in 2006. Garza is currently trying to learn the essential Black Sabbath bass riffs, the early years. Oscar Zeta Acosta was an attorney, writer, and activist. He participated in many key events in Los Angeles’ cultural, political, and social history during his time, including running for sheriff of Los Angeles County on a singular platform that promised to completely abolish the sheriff’s department if and when he won the election. His myriad of roles essentially made him a lightning rod for controversy that still plagues him, or his memory, to this day. He is probably best known as the infamous Dr. Gonzo in the classic American novel, Fear and Loathing in Las Vegas, written by fellow cultural anarchist, Hunter S. Thompson. Acosta was an accomplished novelist in his own right, publishing two books before his disappearance in Mexico in 1974. Both Autobiography of A Brown Buffalo (1972) and The Revolt of the Cockroach People (1973) have become classics within the Chicano literary canon and remain relevant for their vivid portrayals of the socio-political struggles of the Chicano people in the United States, specifically in Los Angeles, at that time. Sound immediately transcends the object or implement used to create it. The experience of sound is a function of our nervous system, which we are culturally conditioned to interpret and recognize. The very fact that phenomena like infrasound (subsonic sound below 20Hz) can be ‘felt’ but not heard creates a frustrated perceptual impulse, as we are sometimes roused to anxiety by an experience we can neither interpret nor dismiss as ‘noise’. If anxiety can only be resolved by attaching it to an object or cause, then in the absence of either, we tend to create one that is often either preternatural or supernatural. 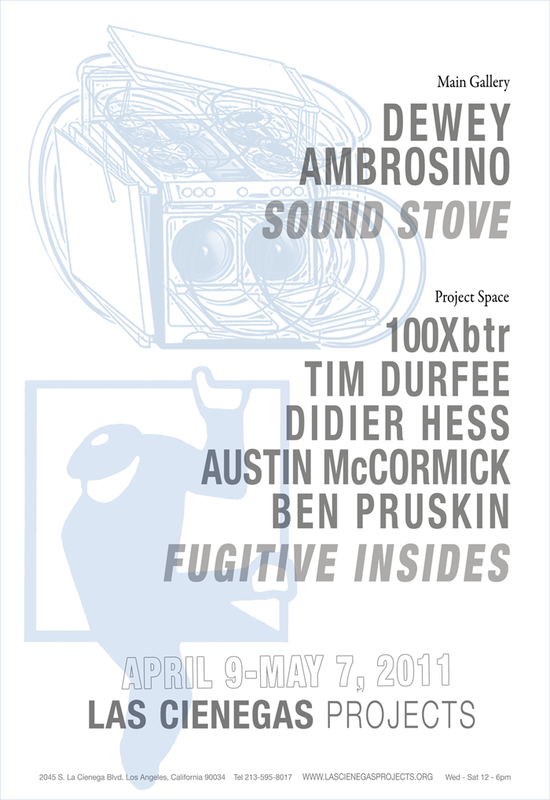 Las Cienegas Projects is pleased to present Sound Stove, a solo exhibition by Los Angeles-based artist Dewey Ambrosino. 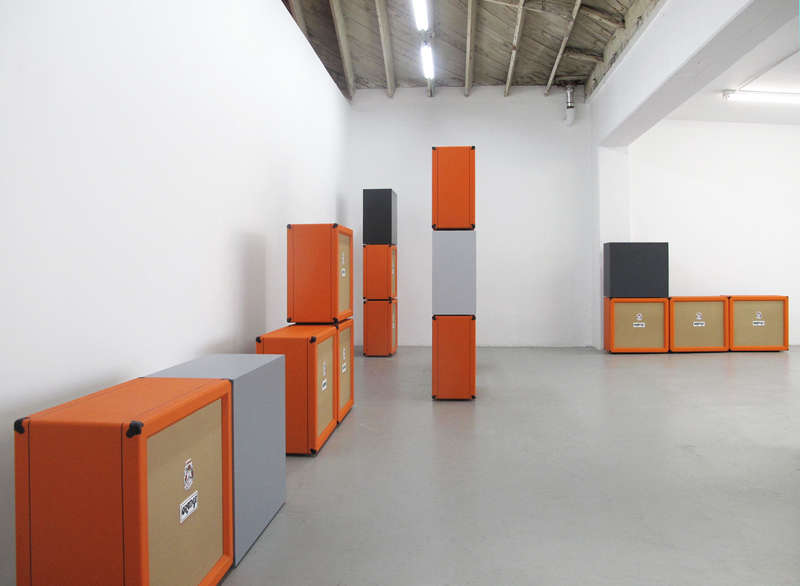 Sound Stove is a full range cymatic installation that uses Cymatics, the study of sound made visible through vibration in matter, to generate a multifaceted sound-light site. 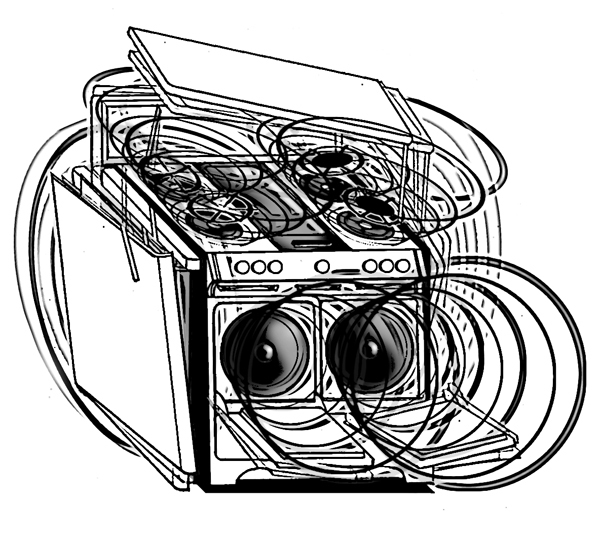 The intention is to show the interpenetrating and interconnected nature of phenomena by prolonging the viewer/listener’s connection with the sound system and its resonant effects on matter, the human body and our aesthetic perception. The Sound Stove itself is a 1952 O’Keefe & Merritt stove outfitted with two 15” subwoofer speakers in the ovens, four tweeters, and four midrange speakers that have replaced the burners underneath the grilles. 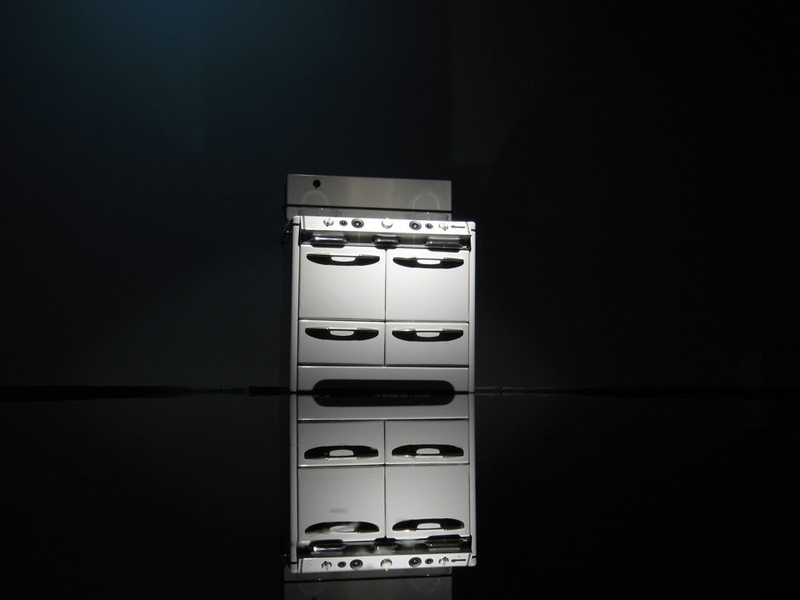 In a reflection pool, the Sound Stove sits under theater lights, while on the stove sit varied containers with select contents to be “cooked” by the “beat burners”. As a rotation of content is “played” (compositions, experimental form generator sounds, dB drag racing – test tones or “burps”, and “bass race” competition tracks), each one is accompanied by its corresponding psychedelic-cymatic phenomena, projected onto the gallery wall. The projections create a phenomenology and typology of form that is especially pertinent in shape-building in nature and art. 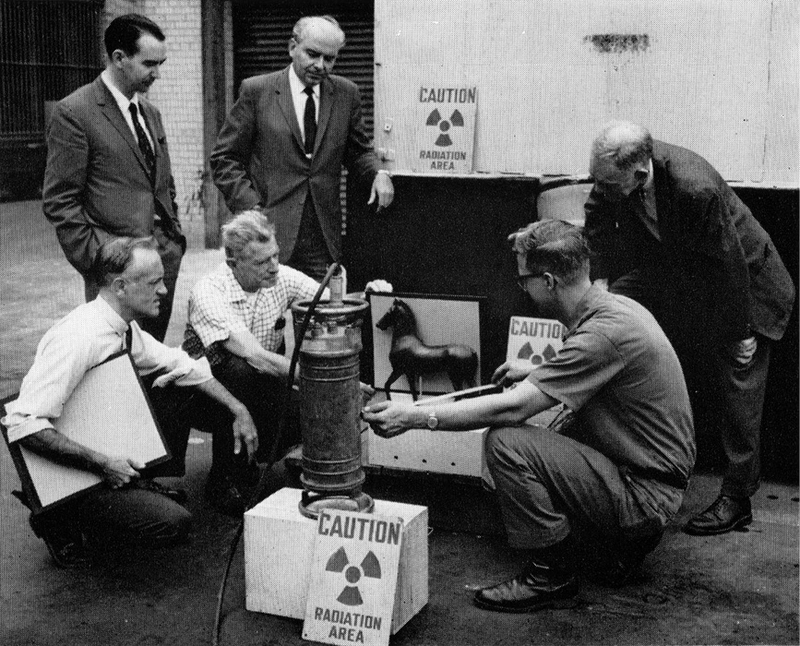 To date, there has been no known full-range cymatic experiment of this scale and parameter. Dewey Ambrosino (b. 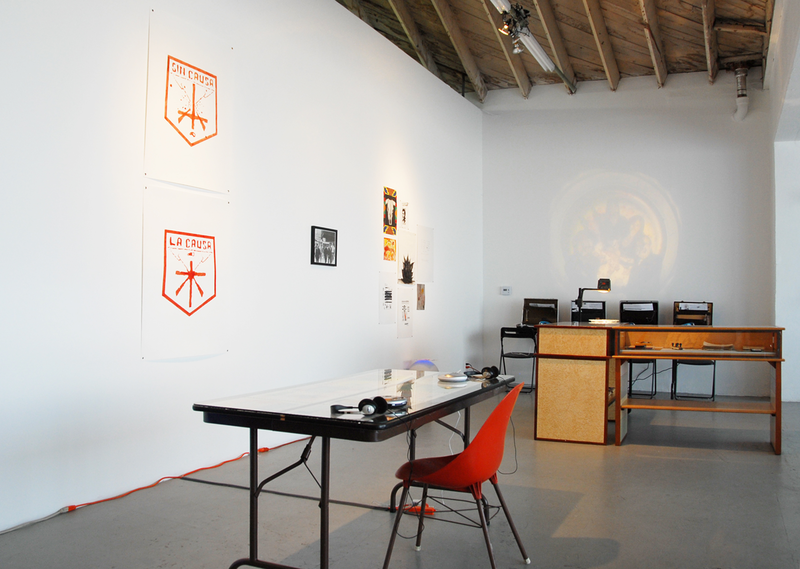 1967, Chicago) looks at space, sound, and art and design objects, folding one into the other. Ambrosino’s interdisciplinary practice is inspired by sound and its formative powers that can be used to generate visual art. Ambrosino holds a BFA in Sculpture from the University of Illinois, Chicago, a BFA in Industrial Design from the University of Illinois, Chicago, and an MFA in Art from CalArts, Valencia. 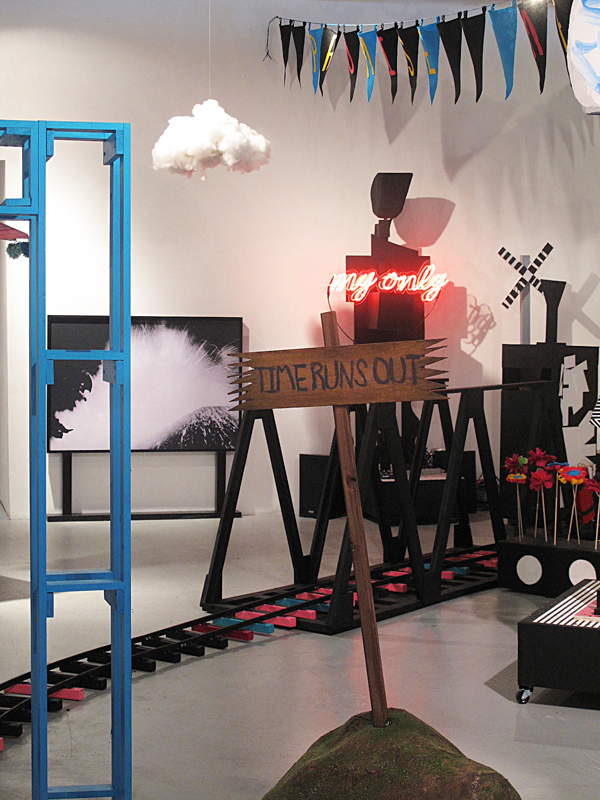 Las Cienegas Projects is pleased to present Fugitive Insides, a group show featuring work by 5 Los Angeles artists, architects and designers whose theoretical practices center around the built environment. Included are installation-based, furniture and mixed media works by 100Xbtr, Didier Hess, Tim Durfee, Austin McCormick, and Ben Pruskin.